Through the years, wedding favors have become more and more an important detail for a wedding. Favors are a wedding custom that started many years ago and it is one of the most beautiful and traditional customs. Centuries ago, families used to celebrate a wedding by exchanging small gifts, usually sweets. This tradition symbolized good luck, happiness and fertility. The tradition spread and changed, since in every region they offered favors indifferent flavors andshapes. Today, the tradition has not changed, but it has evolved even more, with different preferences and styles. You can find a variety of wedding favors in various shapes, designs, colors and uses. There are boxes, pouches, containers, glass jars and other unique favor ideas that will certainly impress your wedding guests. You can choose between a decorative favor, a favor that can be used for your daily activities or a favor that combines both functions. Some of the most popular wedding favors today are pouches or boxes with candy, bottles with wine or olive oil,jars filled with jams, honey, seeds and wedding favors that are soaps and candles. Giving wedding favors to your guests is a kind gesture that shows your appreciation for those who attended your wedding. It is your way to say thank you and offer them something to remember your wedding in the years to come. Do not worry about what you should choose to impress your guests. You should choose something that represents you and your partner. 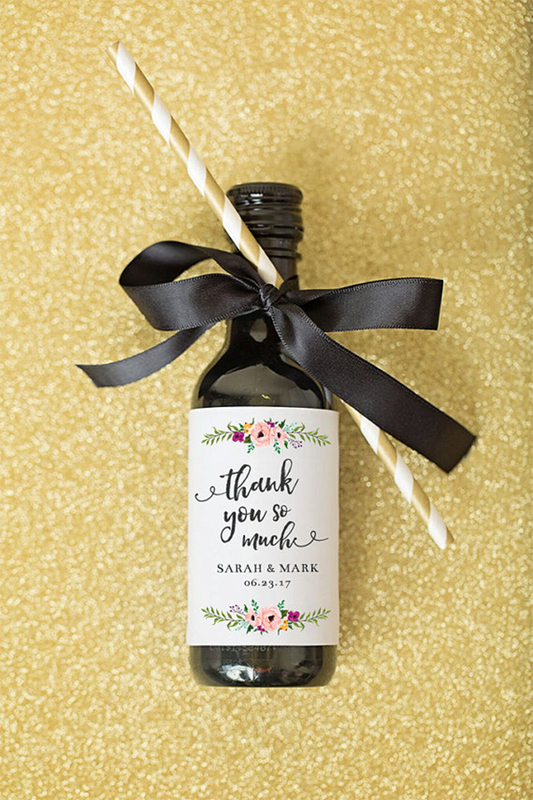 Don’t forget that wedding favors are a sweet, personal touch you have chosen to add to your wedding, so they must really represent you and your style as a couple. 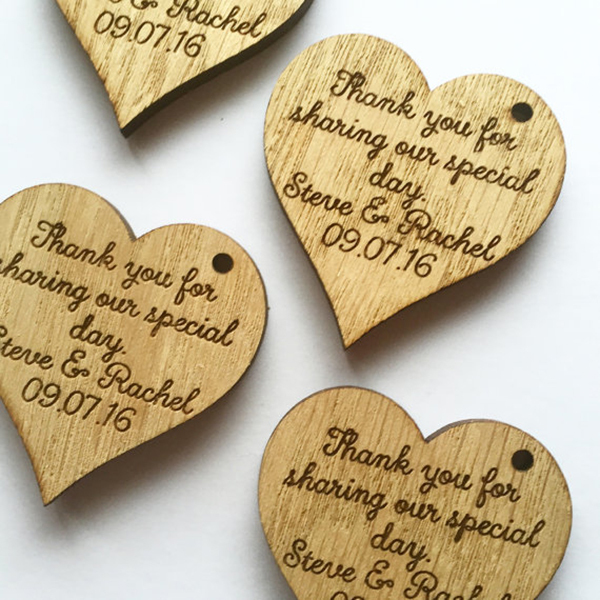 Spend some time finding wedding favors ideas, choosing those that are perfect for you and add your personal touch! 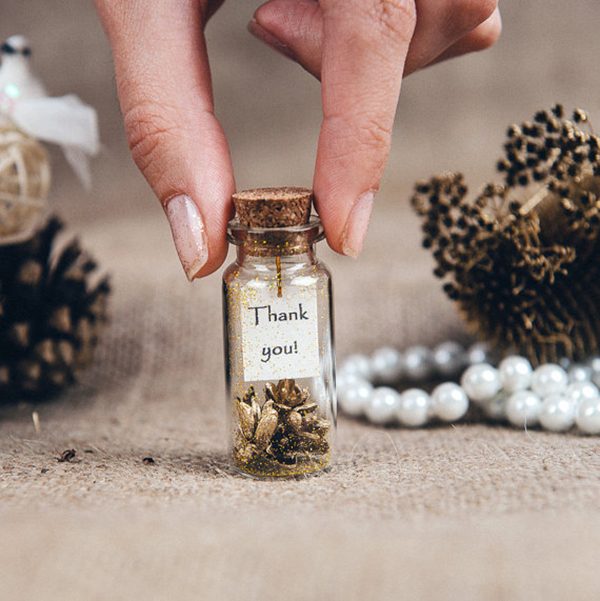 Your guests will immediately realize that your wedding favors is your genuine way of saying“thank you”. 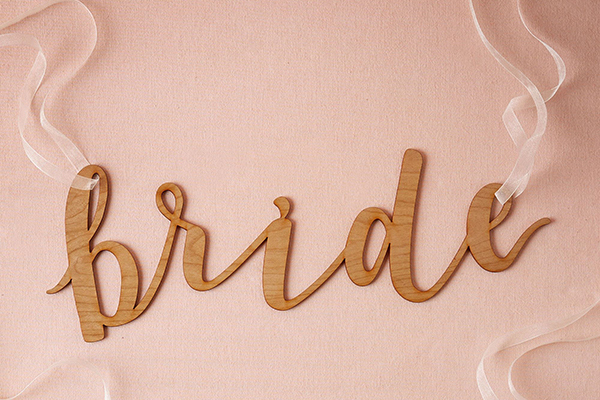 We are so excited to share with you this ultimate guide on wedding favors. Unique designs, shapes and colors that everyone will enjoy. 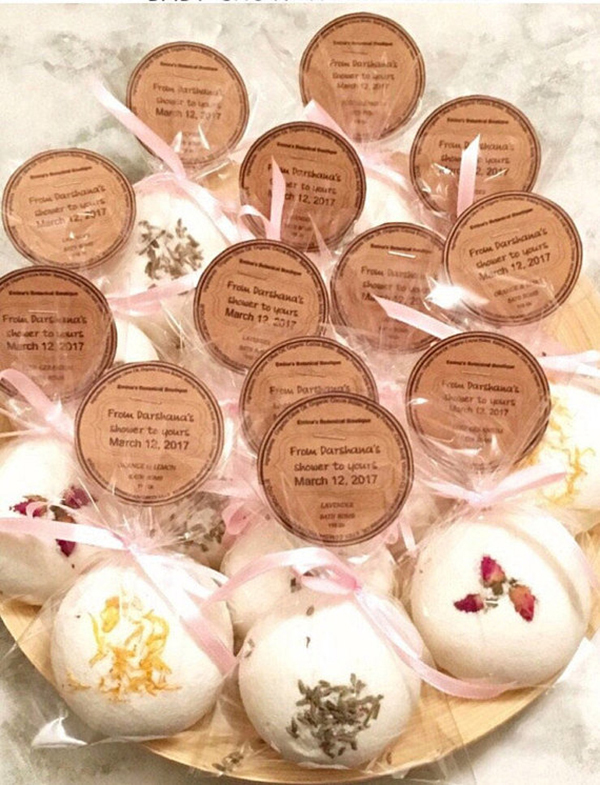 From small botanical bath bombs to special hangover kits, these wedding favors will not only impress you, but also your guests! A look at the following list will convince you! 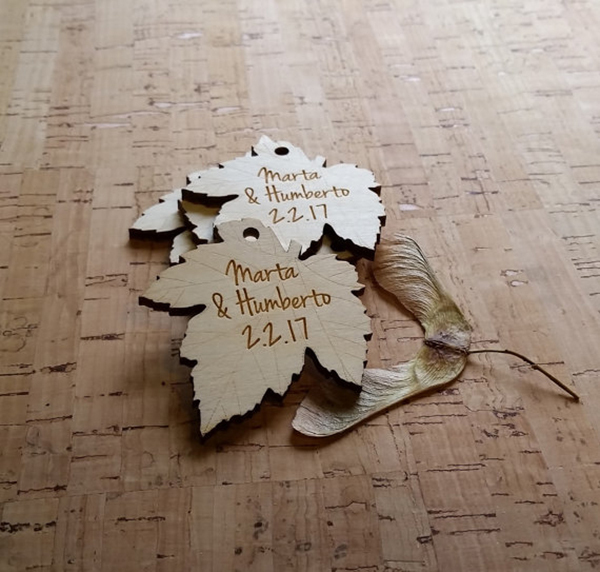 We are sharing the most unique and special wedding favors available for all those of you who do not want to offer an ordinary wedding favor to your guests! From seed bombs to hangover kits, these wedding favors will amaze your guests and make an impression! 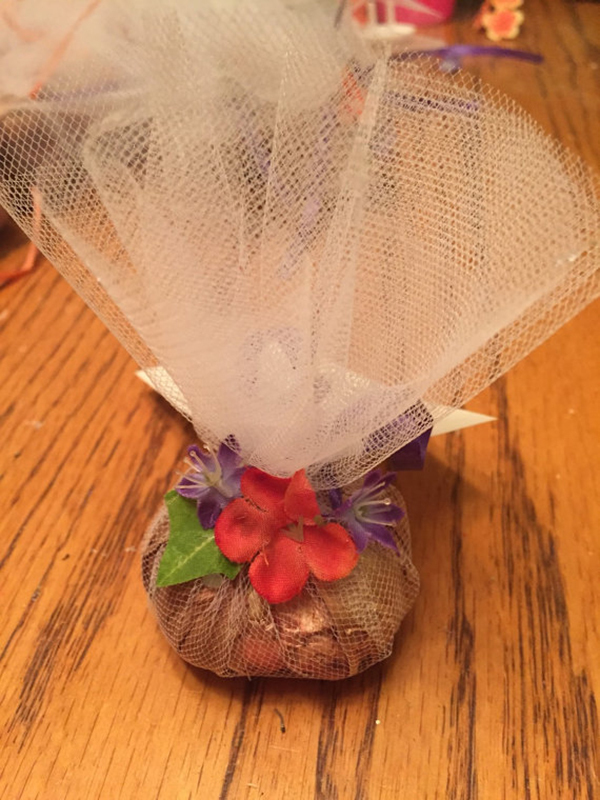 A unique wedding favor with 10 botanical seed bombs with wildflowers seeds and pretty botanical on the outside and a "how to" card. 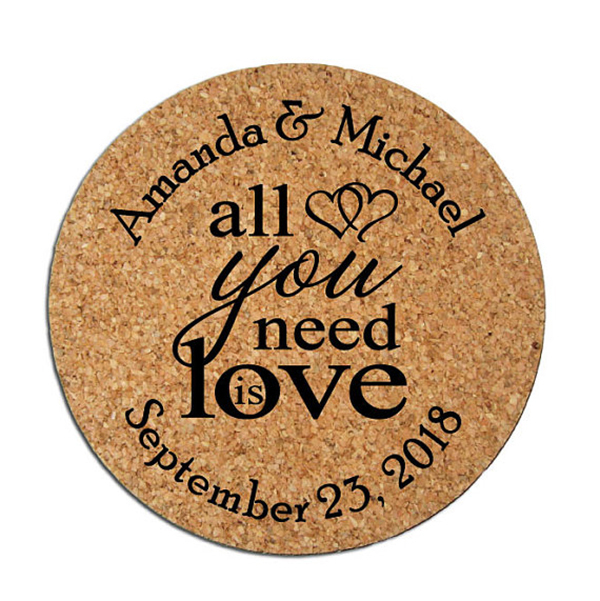 Wedding favor cork coasters printed with a one-color "All you need is love" design. 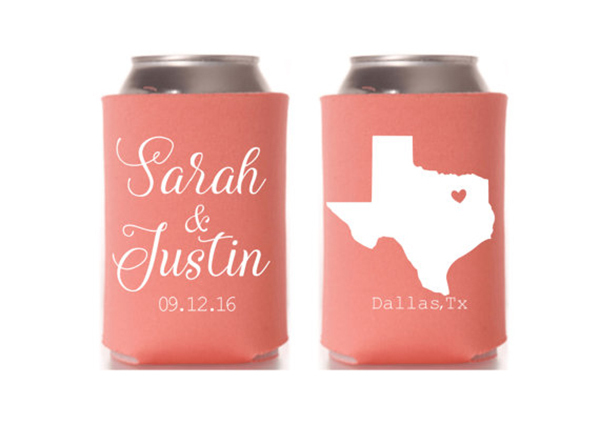 They can be personalized with any names and wedding date. These personalized tea pouches are the perfect size for your standard tea bag & have an easy peel & stick closure. They are ready for your favorite tea to be tucked inside. Unique can cooler to elevate your favors and add that "special" detail! They can be customized with your name(s), date and location. 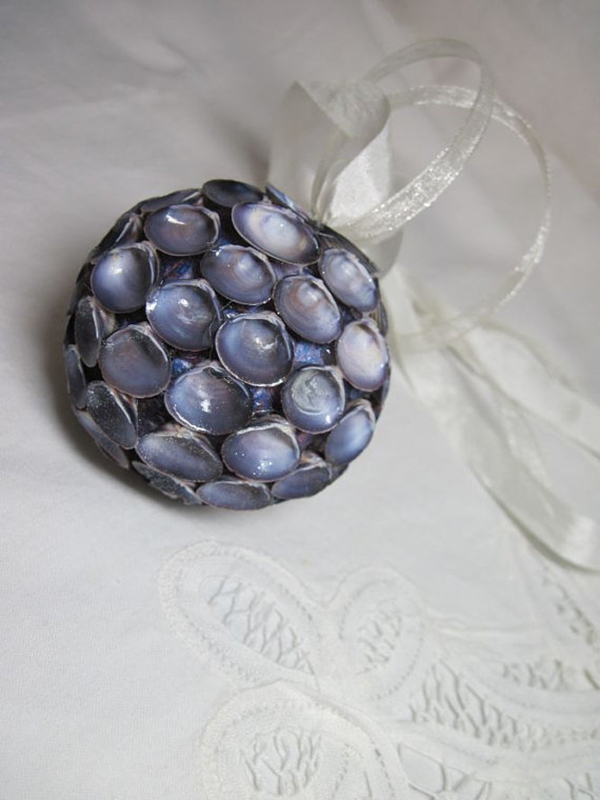 Sparkly beach shell ornament made from purple seashells which is an ideal favor for Christmas or beach weddings. 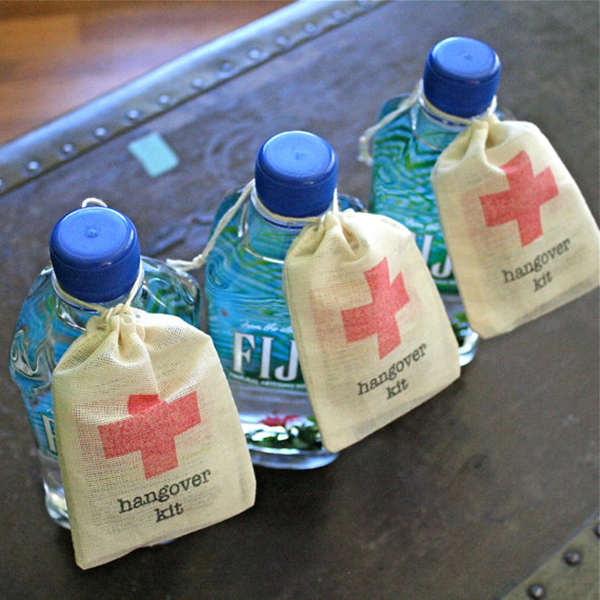 Hangover kit bags are a perfect final touch for your wedding reception! Let your guests leave armed with the necessities to survive the "morning after." 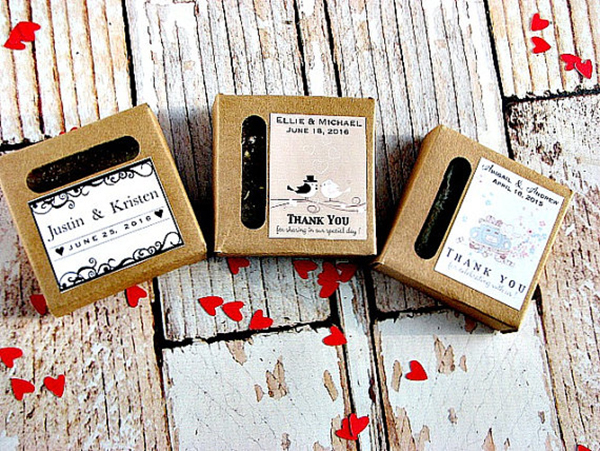 Unique wedding favor seed kit with special heart seeds perfect for a rustic, romantic spring or summer wedding! It is personalized with two custom stamps. 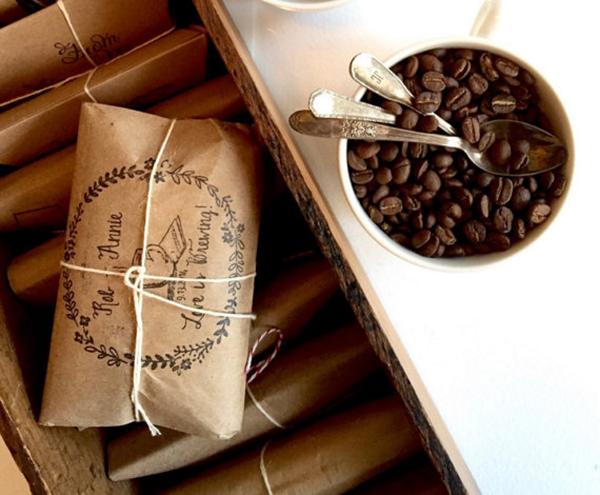 Gourmet coffee favors, handcrafted and customized to order, perfect for rustic, autumn or winter weddings. Freshly roasted in small batches, each favor is enough for one pot and is hand stamped and tied with twine. If you want to make your wedding memorable and add a custom touch, you can offer personalized wedding favors to your guests. Favors with your initials or wedding date printed will be much appreciated by your guests and we will be unique to your wedding day! 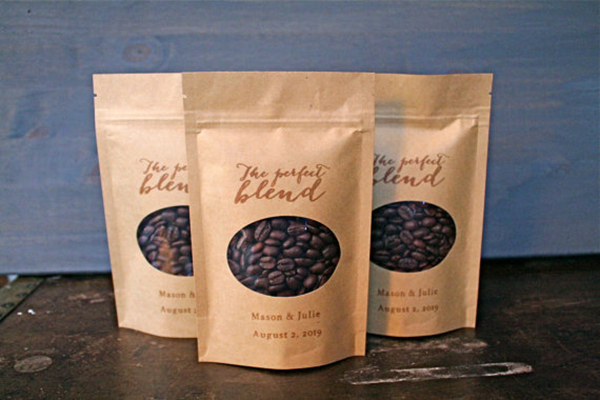 Perfect rustic favor bags for your coffee themed favors! Kraft brown bags with glassine lining and zipper (zip lock) closure keep your coffee favors fresh! Each bag is hand stamped with a script 'The Perfect Blend' design, along with your custom names and wedding date. 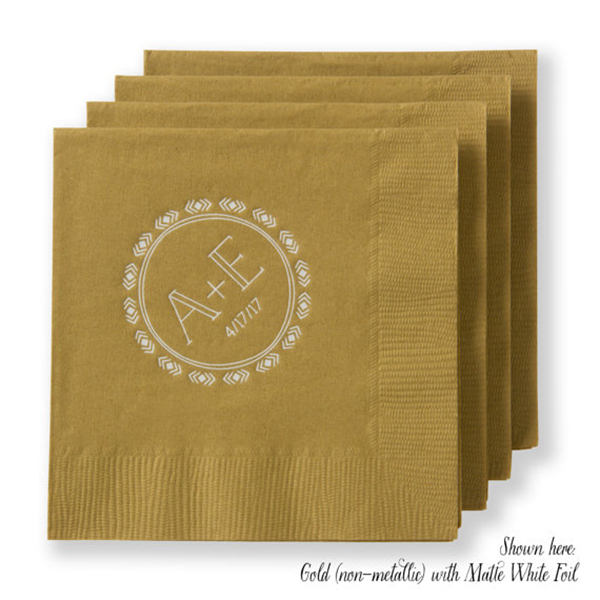 Personalized cocktail napkins with your initials and wedding date. 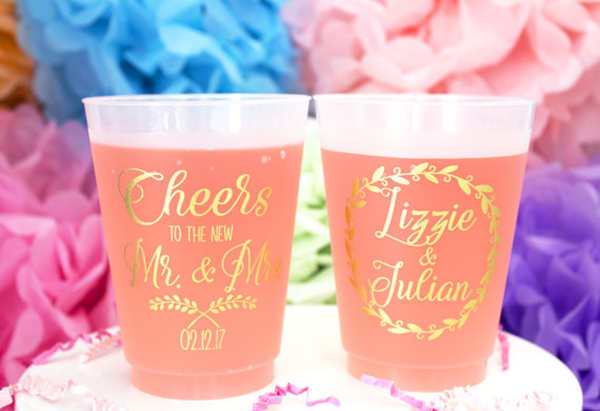 These personalized plastic cups are great to give as a gift, stuff with goodies, or add into your welcome bags to celebrate your event. These eco-friendly soy wedding favor candles are the perfect way to thank your guests for sharing your special day. You can also have a personalized label with your initials and wedding date. We have chosen and share the most beautiful rustic wedding favors to give to your guests. These wedding favors will fit perfectly to your rustic wedding style and your guests are going to love them! You can offer your guests organic lip balm favors with all organic oils, that smell sweet and delicious! They are flavored with maple syrup and the cocoa butter flavor is a nice match of maple chocolate. 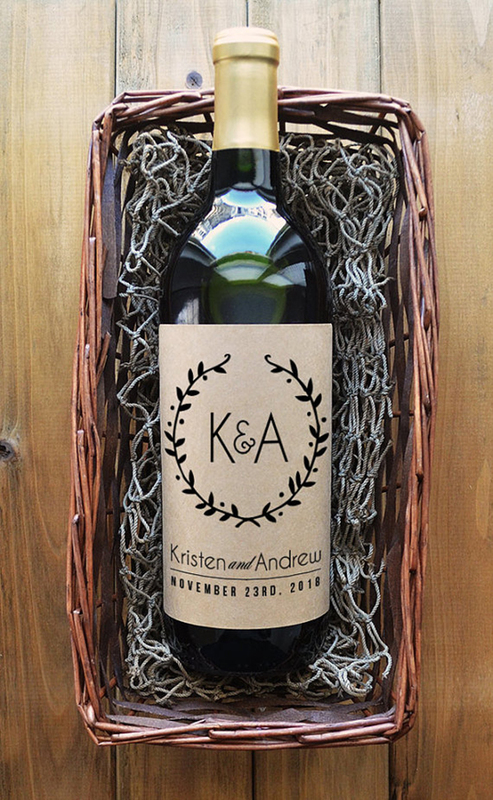 These brown craft labels for your wedding wine will add a rustic touch to your wedding. They can be personalized with your initials, names and wedding date. These handmade soaps are the perfect favors for a rustic wedding. They are adorned with a string, a piece of burlap and a chalkboard style cardstock heart with any message you desire. These wild flower seed kits allow your guests to plant and remember your special day for years to come. Each kit comes with a card detailing the seed types and care necessary. For a wedding with a vintage style these beautiful vintage wedding favors are just perfect. With lace and vintage prints, these wedding favors are adorable and your guests will really appreciate them! These romantic white hearts make fantastic, unique, original and pleasant wedding favors. They can be used as gift tags, necklaces and table decoration. The individuals may customize them by their own essential oils or leave unscented. 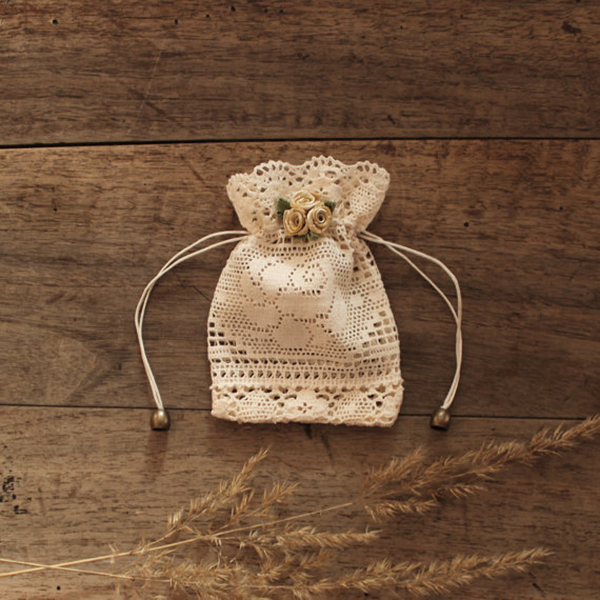 This lace pouch is perfect for small gifts such as candy, hair accessories, cosmetics, seashells, jewelry or whatever small object you would like to put there for your guests. If you are looking for elegant wedding favors that your guests will really like and appreciate, the following favors are perfect for you. From beautiful candles to wine charms and boxes with macarons, these wedding favors fit perfectly to an elegant wedding. 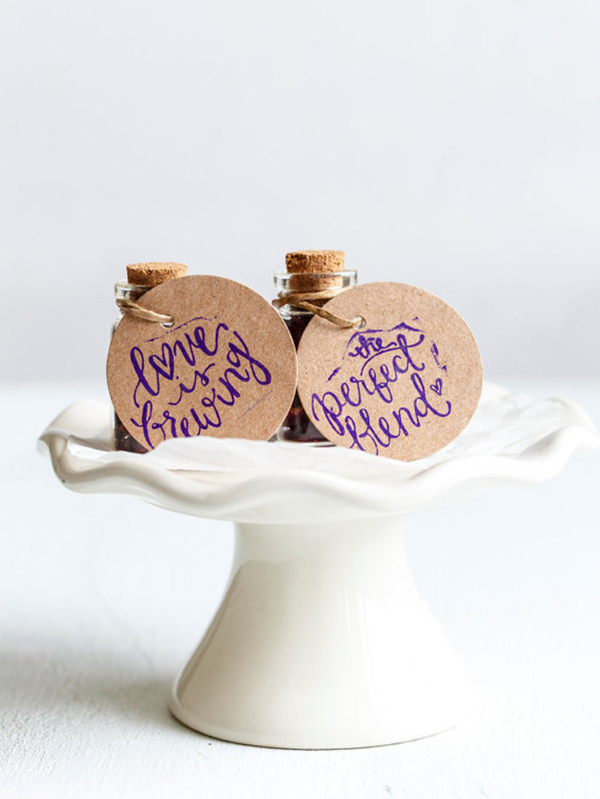 Creating your own wedding favor tags is easy with this simple template. 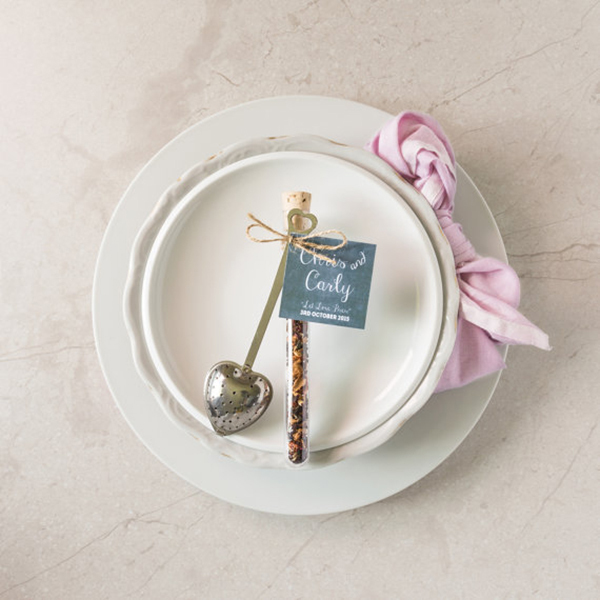 You can create elegant favor tags to impress your guests. Infinity bottle opener with engraved acrylic or wooden gift tag to give to your guests as wedding favors. 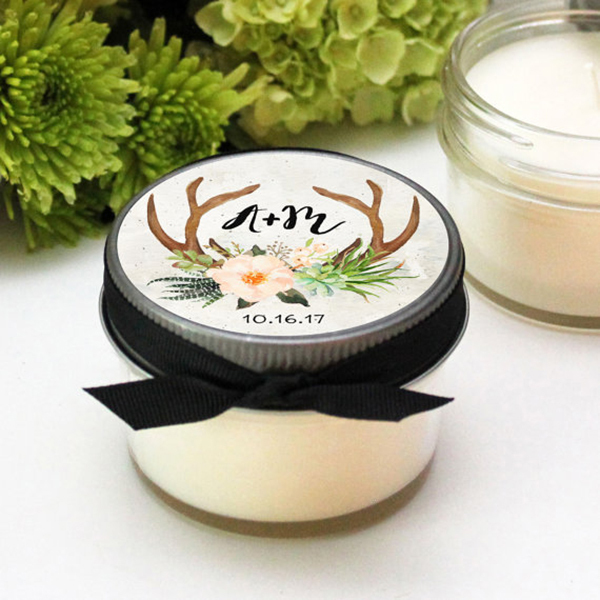 These eco-friendly soy wedding favor candles are the perfect way to thank your guests for sharing your special day. The candles are topped with your personalized label. 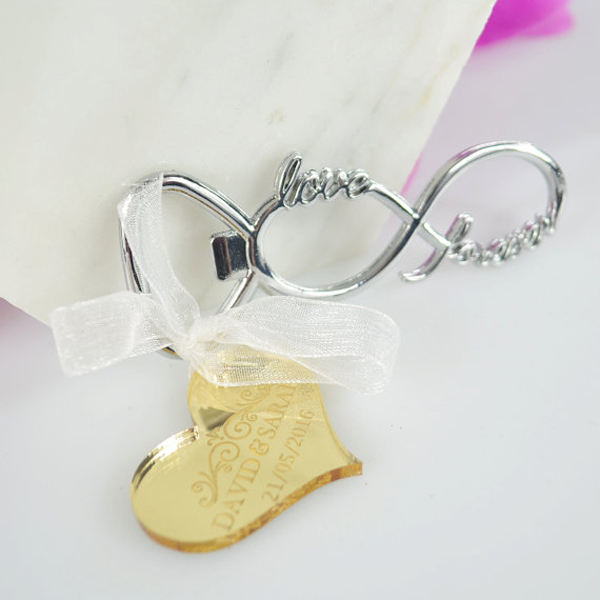 These personalized wine charms are the perfect elegant touch and keepsake to any elegant wedding. They can be tied on using your favorite rustic raffia ribbon or organza ribbon,. You can offer your guests a lovely box with two French macarons. 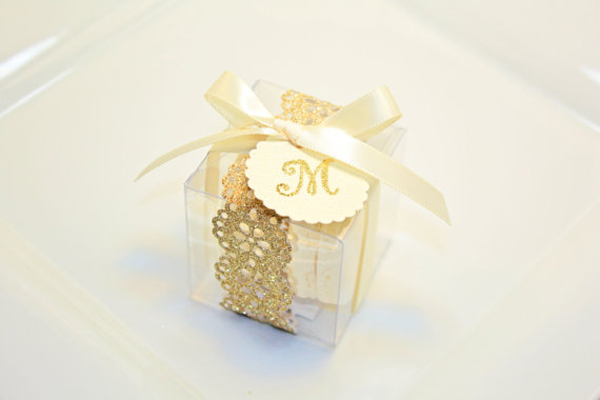 The favor box is tied with an elegant handmade glittery gold doily, favor tag and satin ribbon of selected color. Creative wedding favors are the perfect option for those who do not want to give a simple and ordinary wedding favor to their guests. If you are looking for favors that are creative and original, there are plenty options to satisfy your needs, such as printed wedding golf balls and puzzle favors. 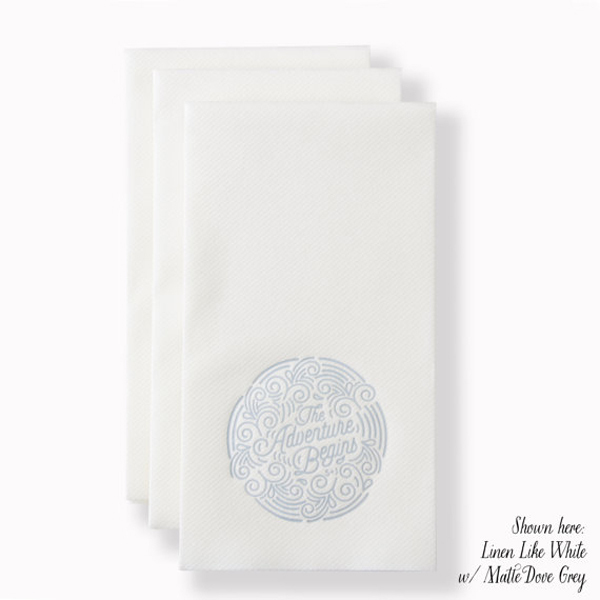 These personalized linen like guest towels are a beautiful touch to an elegant wedding. 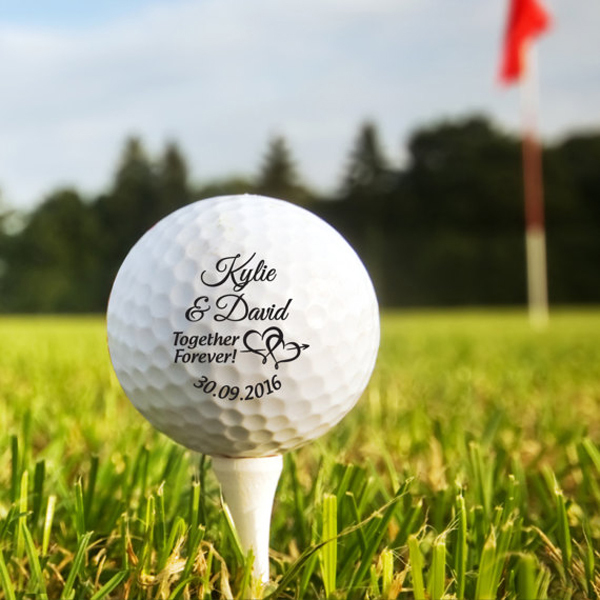 These custom printed golf balls are one of the most creative wedding favors ever! You can use these popcorn bags to hold a standard philly pretzel, pretzel stick or lots of mini pretzels. Your wedding guests will be really excited! 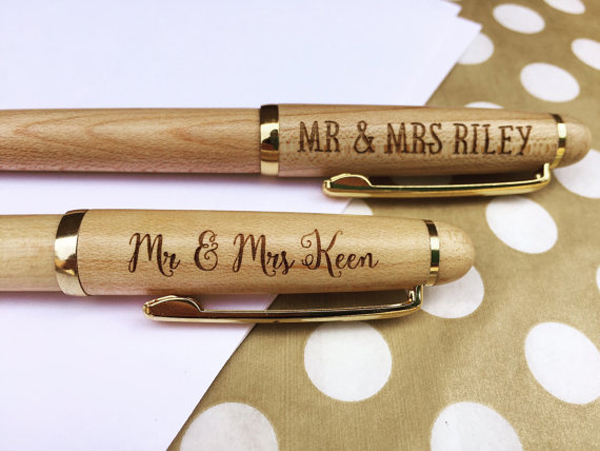 Engraved with your chosen name these pens are perfect for your wedding day and can be used after as a lasting memory. 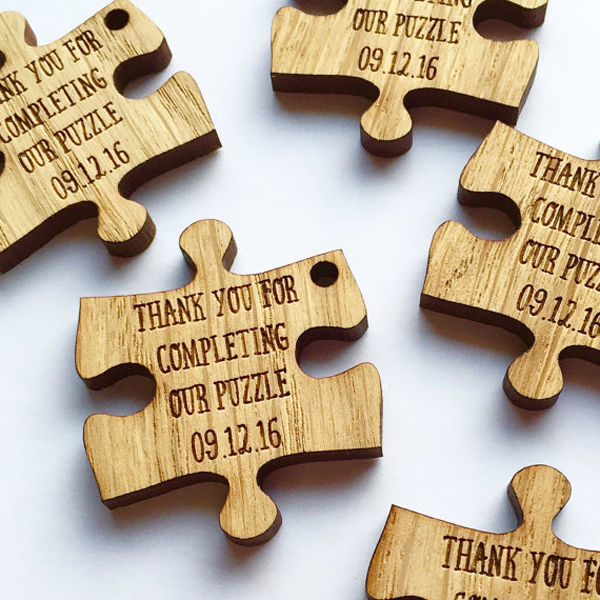 If you are looking to throw a wedding with a childhood game theme, or just want to celebrate your achievement for solving the riddle of love, these custom puzzle piece wedding favors are perfect for you. If your are loving traveling or if you are having a travel themed wedding, you should offer your guests wedding favors that are inspired by traveling. 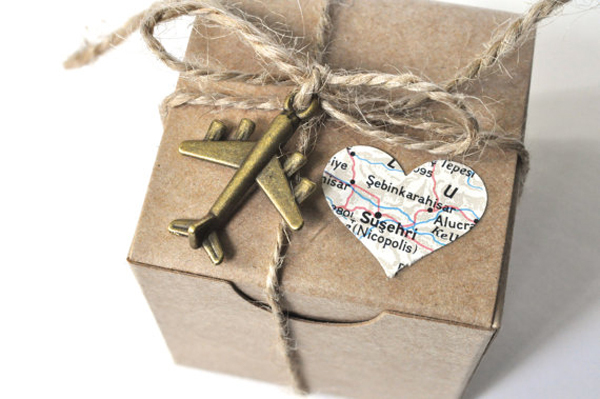 Travel theme favor boxes or map paper seed hearts are great options for you. These travel theme wedding favor boxes come with an adorable little airplane charm, twine, and a little heart cut from a vintage map. 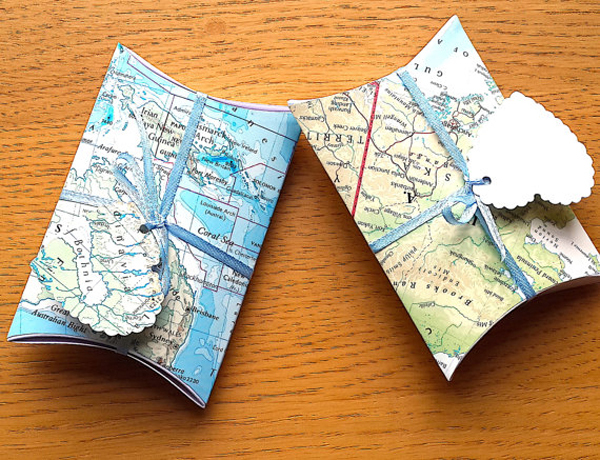 For a wedding with a travel theme, these pillow boxes made from atlas pages are perfect. The boxes are decorated with mini heart shaped gift tags and blue ribbons. 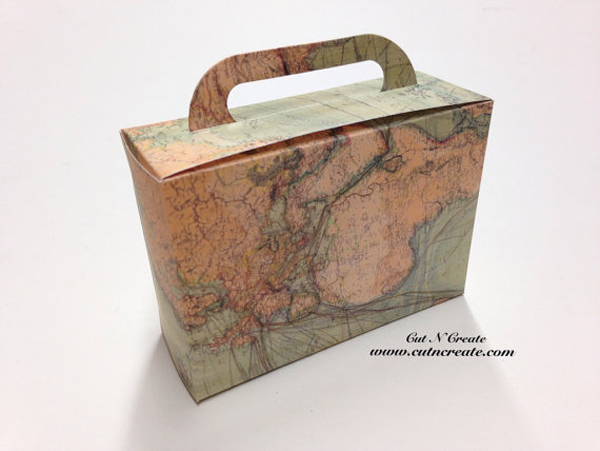 Use this adorable map suitcase-shaped favour for destination weddings and travel themed weddings. You can choose which map you'd like to be printed on the suitcases. These cute little kraft boxes are perfect for wedding favour boxes, just add little candies or a small gift. 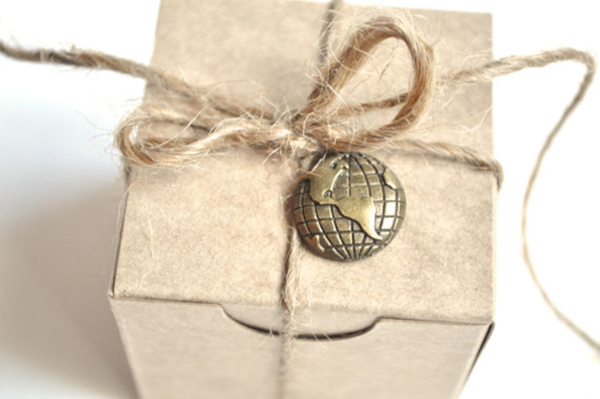 The box is decorated with a jute string and a globe charm. 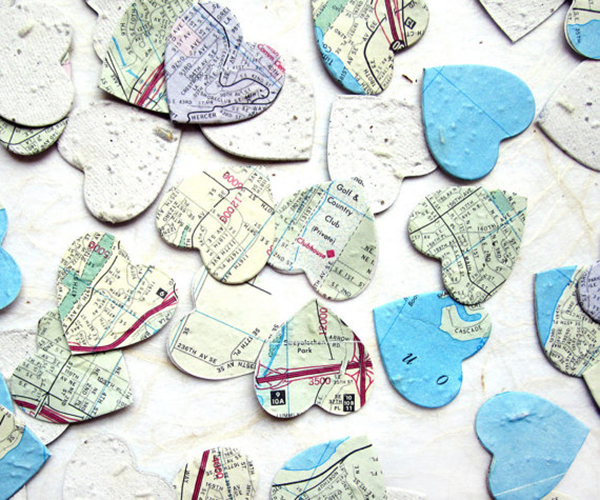 You can scatter these map paper seed hearts on tables; they make a wonderful decoration that guests can take home to grow. 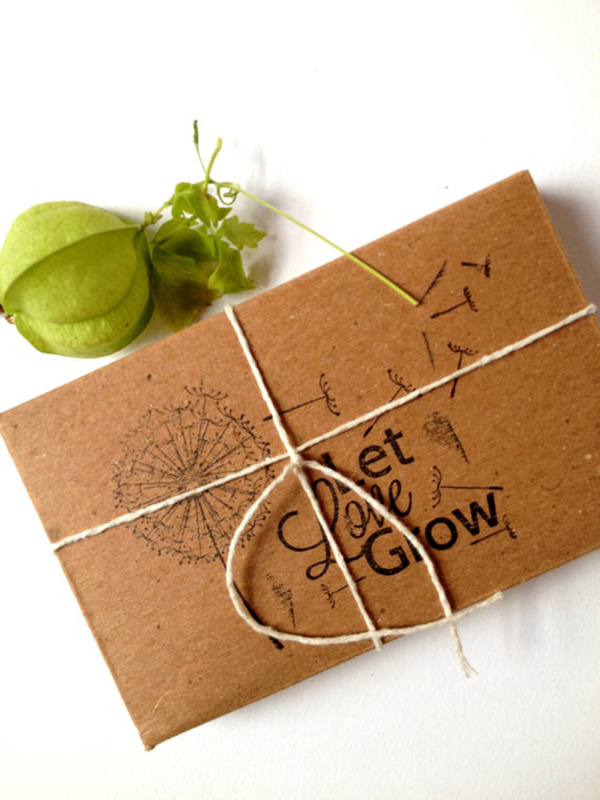 The plantable hearts are chock full of a mix of perennial and annual flower seeds embedded right in the paper. 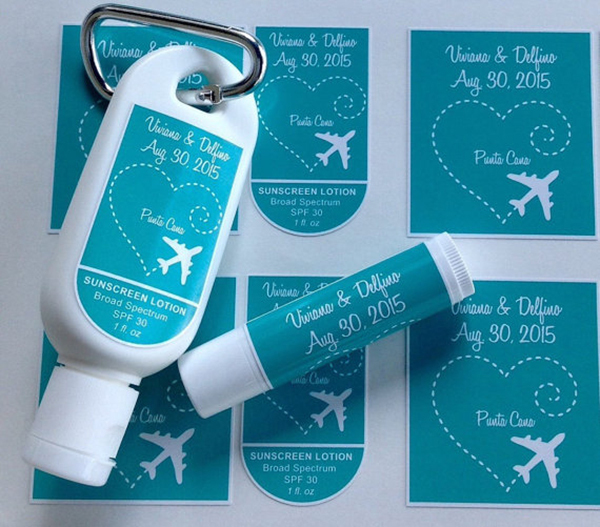 If you are having a destination wedding, you can offer your guests a set of sunscreen and lip palm with custom labels. 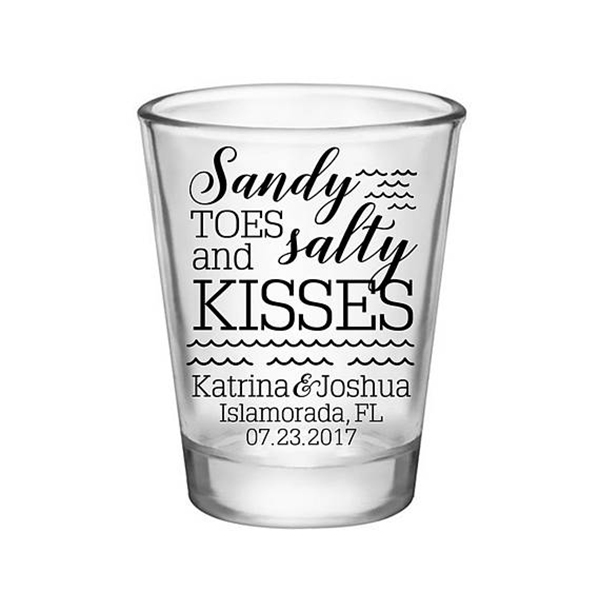 For a destination wedding, these custom shot glasses are the perfect wedding favors. In case you do not want to offer the usual wedding favors to your guests and you are looking for an alternative, the options that follow are ideal. Can coolers and tea in glass bottle are some of the many options available. 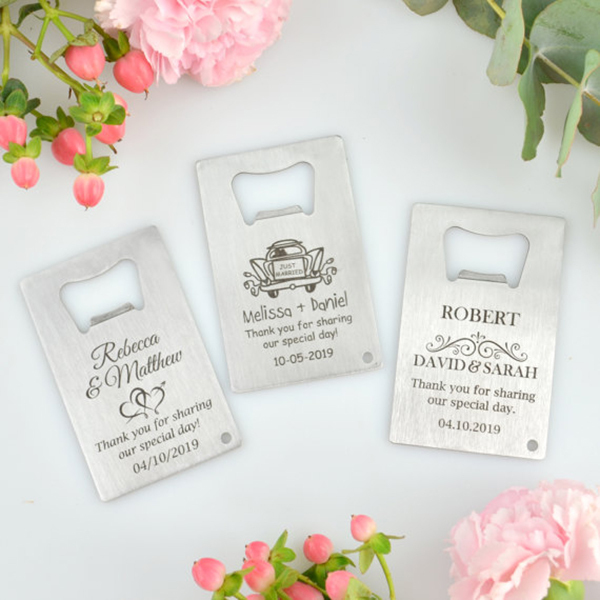 Show your groomsmen how special they are to you on your big day with a personalised credit card bottle opener. They fit comfortably into a regular size wallet or simply in your pocket. Every time your groomsman opens a bottle of beer, they will be reminded of how they were a part of your special day. A unique stunning wedding tea favour for your guests with a choice of tea carefully packed into a corked bottle. You can also add your own little message. 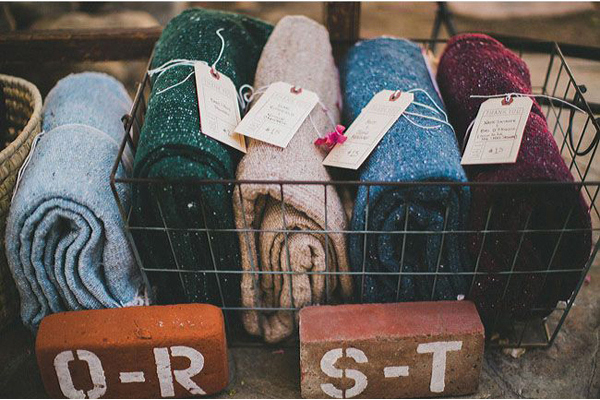 These wedding coolies are the perfect favor for a rustic country wedding. 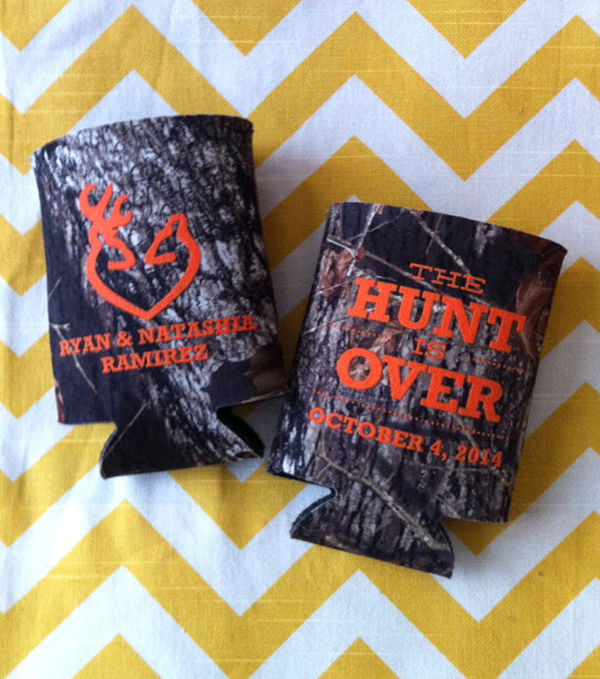 Make that Hunter groom of yours happy with these camo wedding favors! 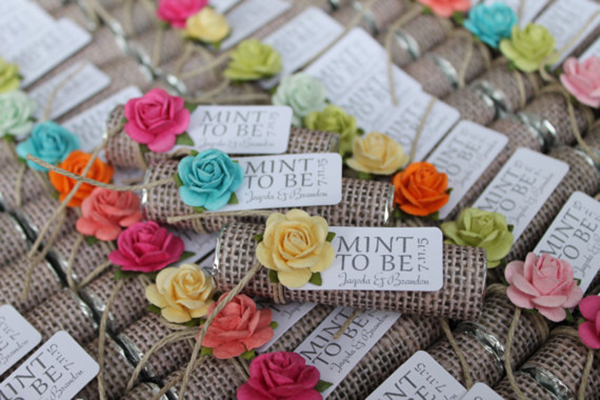 These wildflower seed favors are the perfect wedding favors for your guests. They are a sweet little something guests can take home and plant in their gardens, so they will always remember your "love in bloom". For weddings in Fall, it is a great idea to give your guests favors that are inspired by the season. Homeday jam jars or favor bags with an Autumn theme are ideal and your guests will absolutely love them! 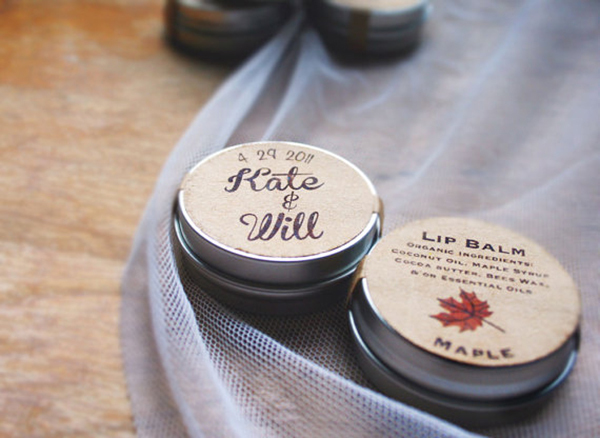 Show your appreciation for your guests with these personalized fall autumn leaves wedding mint tin favors. 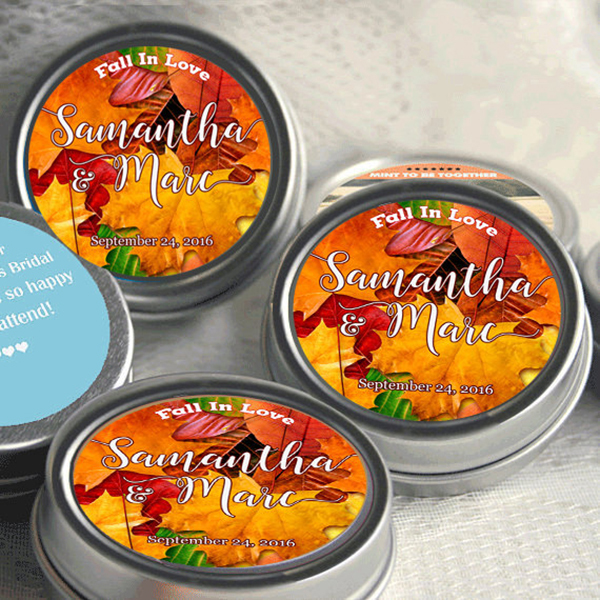 These personalized fall mint tin favors are the perfect candy favor for any autumn wedding reception. 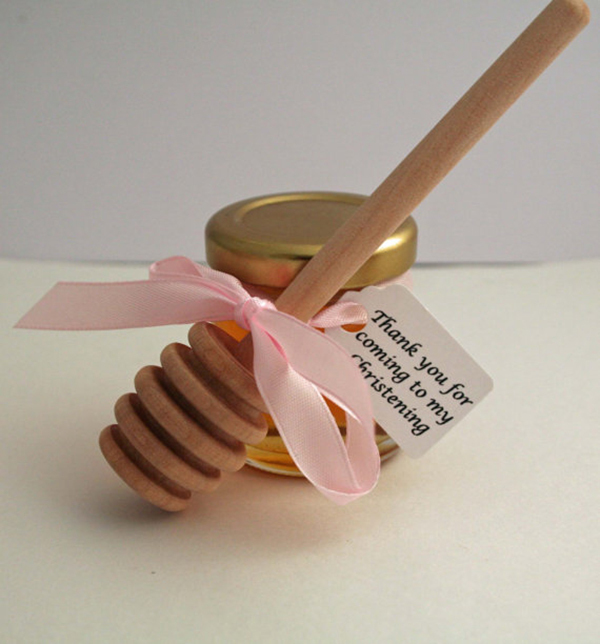 This adorable honey/jars favors are the sweetest gift for your guests. 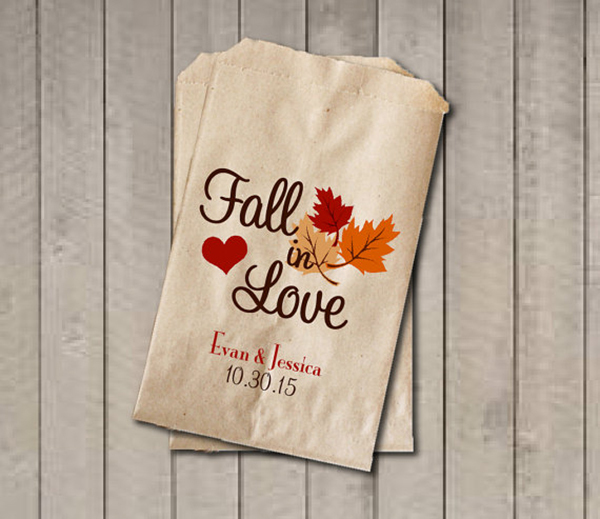 These "Fall in Love" wedding favor bags will be a cute addition to your fall wedding. 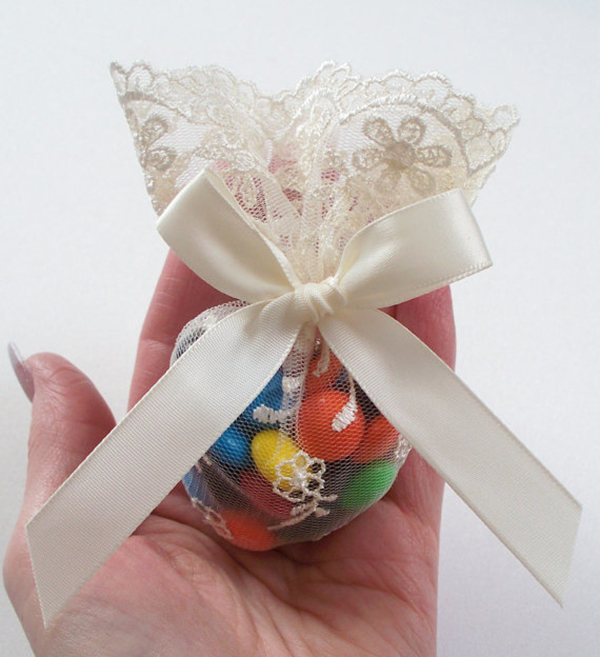 They're perfect for your candy buffet or you can add your own special treats as wedding favors. A gold decorated bottle with natural cones can be a beautiful gift for your wedding guests, especially for a winter wedding. 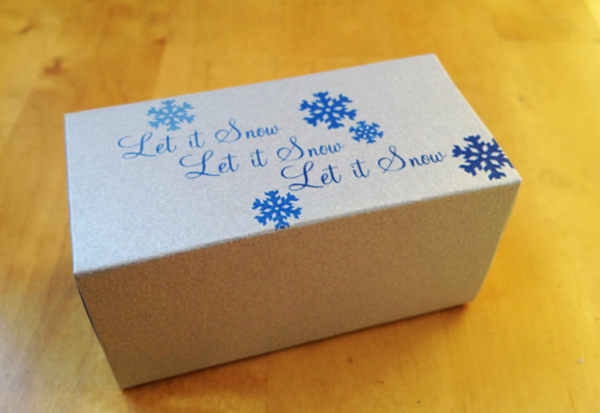 This custom printed favor box is perfect for truffles, caramels, or any other small candy and an ideal favor for a winter wedding. 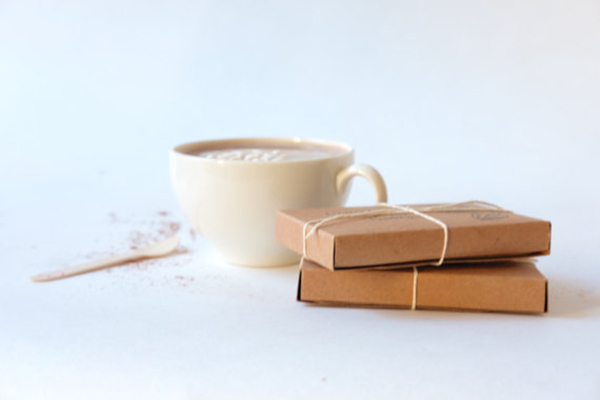 These individual boxes filled with house made cocoa, mini-marshmallows, spoon and instruction card is the perfect favor for a winter wedding. If you are getting married in Spring make sure to offer your guests beautiful wedding favors with flower designs; they are going to love them! Either cherry blossom silk fans or tea pouches with watercolor flowers, spring themed favors will make your wedding even more special. You can simply stick these mini wine bottle labels on a mini wine and offer it as a wedding favor to your guests. 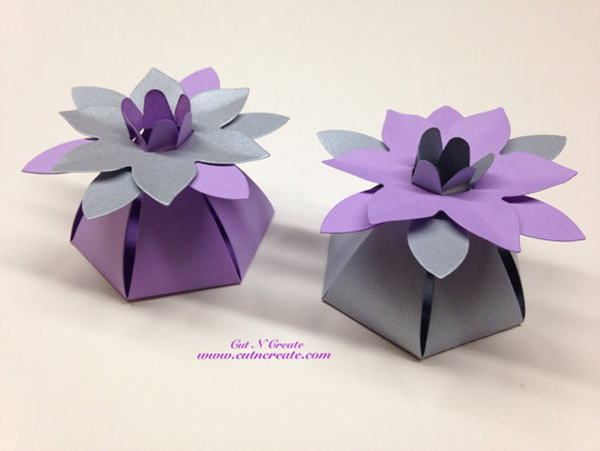 This beautiful silver and purple wedding favor boxes make a big statement, since they are such a unique shape! 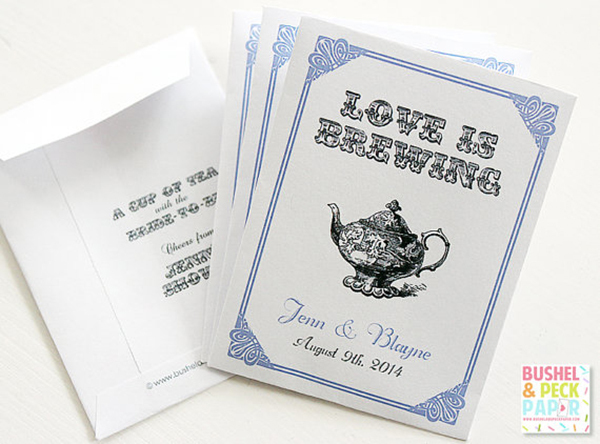 These custom tea pouches are a perfect gift four guests; just tucked inside your favorite tea. Each hand-cut and folded pouch has an easy peel & stick closure. Your guests are sure to be big fans of these delicate cherry blossom design silk folding fan favors. 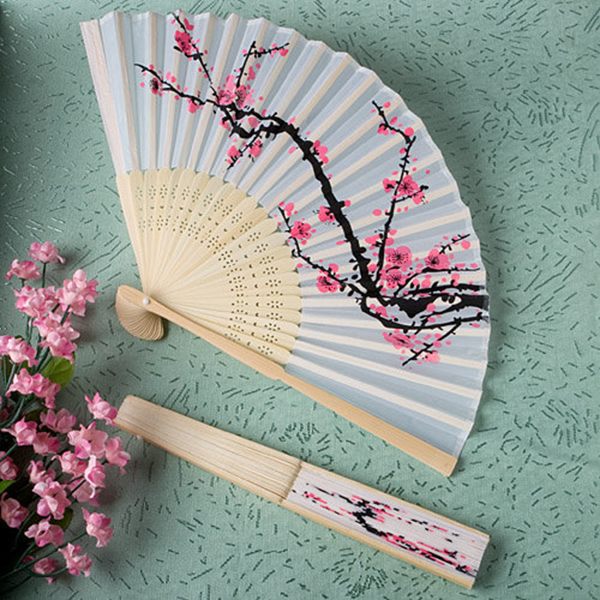 Brilliantly displaying a cherry blossom branch - a traditional symbol of true love - these fan favors are simply sensational. If you are having a summer wedding, you can treat your guests with beautiful wedding favors inspired by summer. You can also add to your favors small details that refer to summer such as flamingo favor tags. 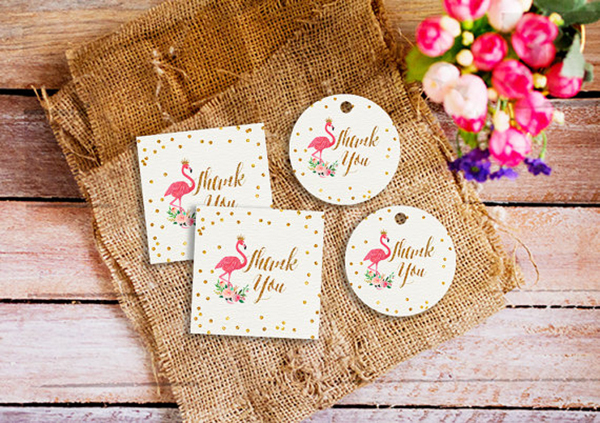 These flamingo favor tags will make your wedding favors so special; your wedding guests will absolutely love them! 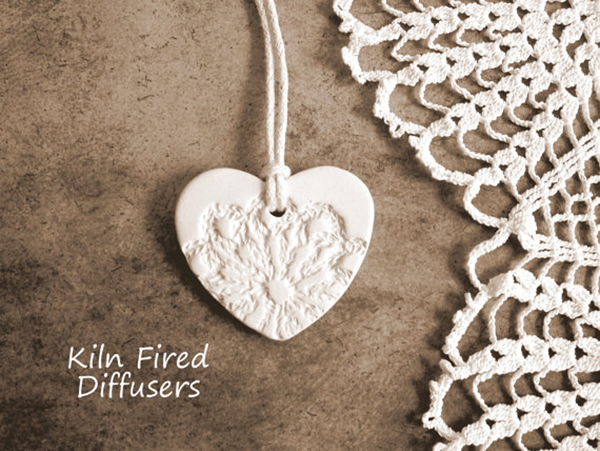 Inspired by the beauty of true love, these handcrafted heart decorations capture the magic of a wedding in a lasting keepsake and are ideal as rustic wedding favors . 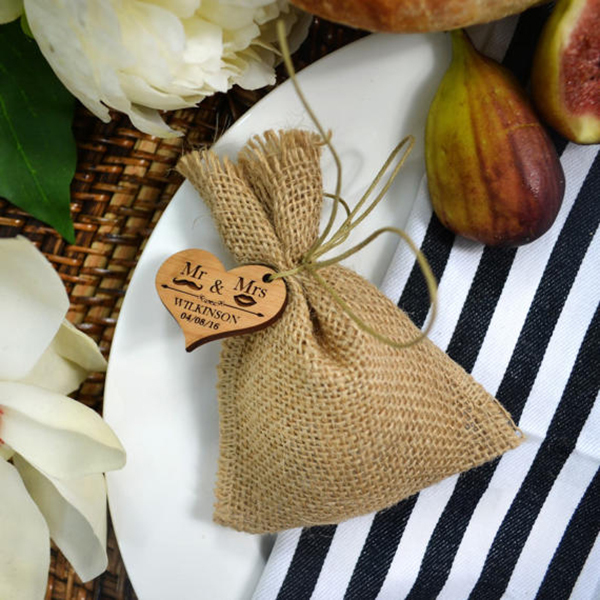 If you are having an eco-friendly wedding or you want to give your guests something natural and friendly to the environment as a wedding favor, you should have a look to the following options. From soy candles to favor boxes made fromthai saa paper, the choice is yours. 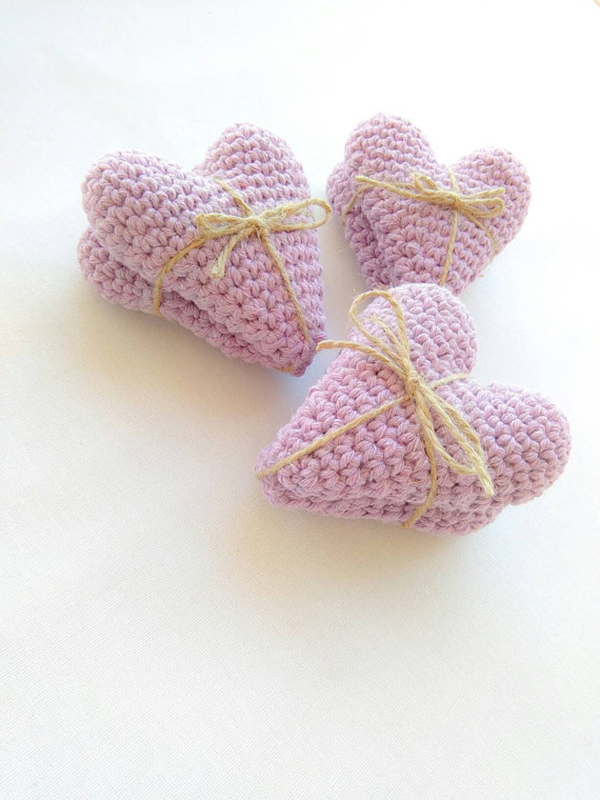 These crochet lavender hearts filled with dried 100% organic lavender flowers from Croatia are a beautifil and eco friendly wedding favor. 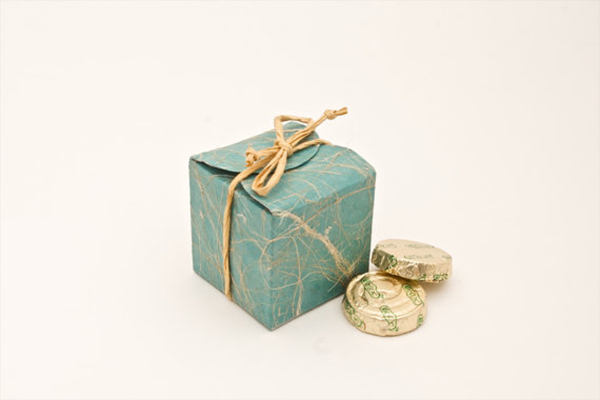 A natural teal colored paper favor box, handmade from thai saa paper with overlapping lid tied with natural paper string that you can fill with sweets of your choice. 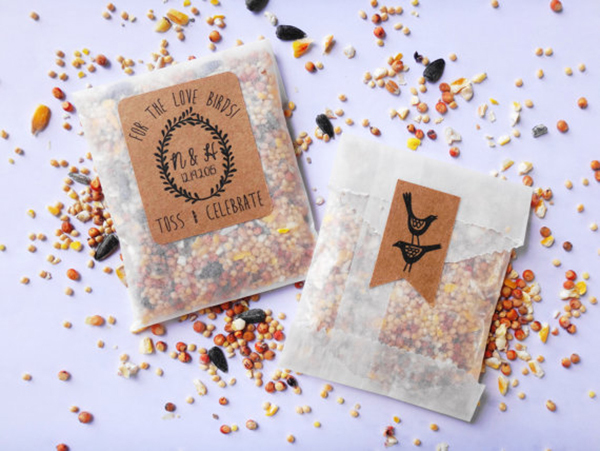 Personalized birdseed favors for your guests to toss and celebrate with you. What a perfect way to have your guests take part in your send-off as husband and wife! 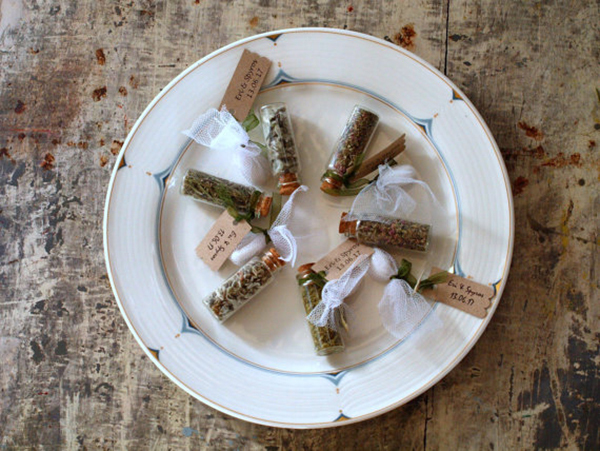 If you are having an eco-friendly wedding, you can offer your guest a glass tube with home grown, handpicked herbs along with a little "koufeta" (sugar coated almonds) treat and a tag with names and date. These personalized, eco-friendly soy candles are a wonderful way to say "thank you" to your guests. Exceptional hand-poured soy candles made from 100% eco-friendly soy wax infused with fragrance and pure essential oils with cotton-hemp wicking that your guests will love. Burlap is usually used in decoration for weddings with a rustic style. 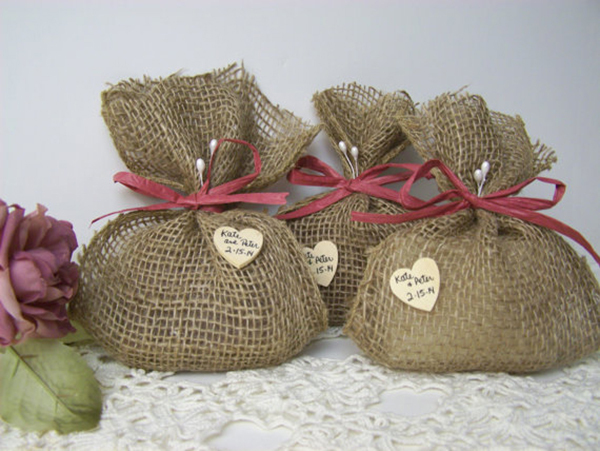 Why not offering wedding favors with burlap to your guests as well? You will absolutely love all the options available. Natural handmade soaps will make the perfect gift for your wedding guests. Adorned with burlap, burgundy raffia, pearl drops, and a wooden heart, these wedding favors are a beautiful gift for your guests. 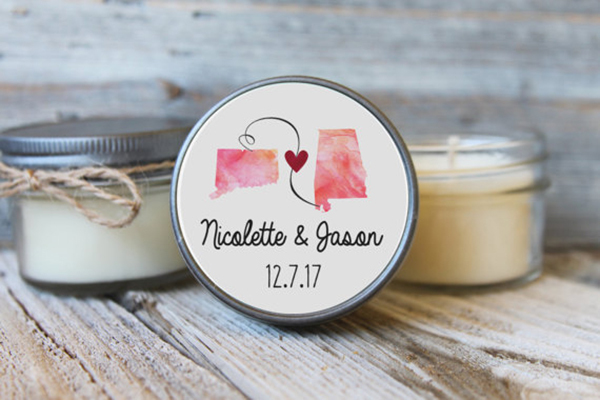 These unique personalized 'Mint to be' wedding favors are a perfect gift for your guests. 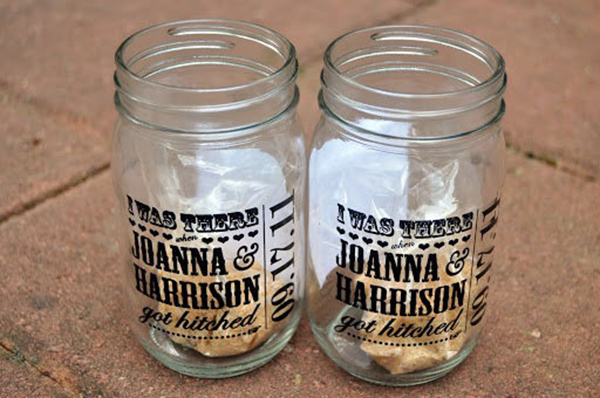 A useful and cute wedding favor option is mason jars; everyone will love them especially if they are personalized! 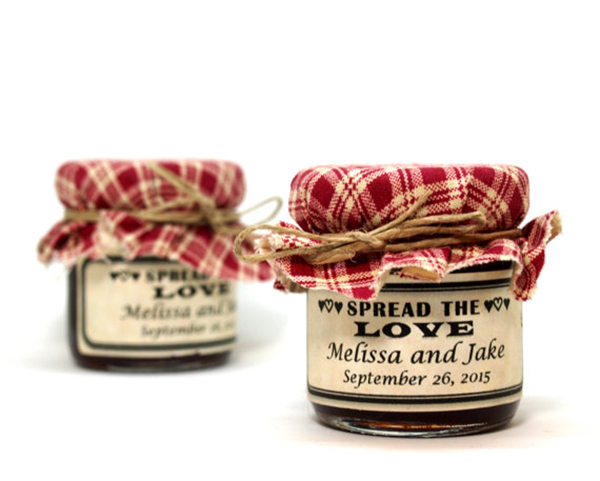 Personalized wedding labels for mason jars that you can offer as wedding favors. 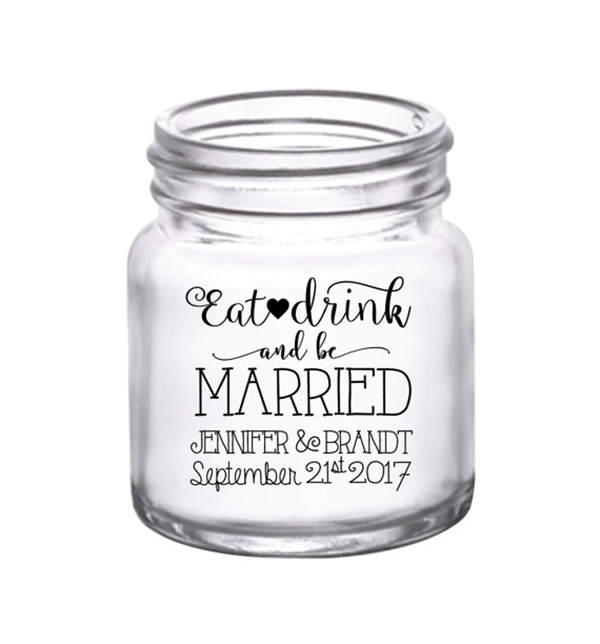 Custom mini mason jars with your names and wedding date that can be used as a wedding favor. There is nothing better that giving your guests a wedding favor that does not only look beautiful, but it also edible! There are plenty of edible wedding favors available and we have make a list with the cutest and most unique wedding favors your guests can eat. 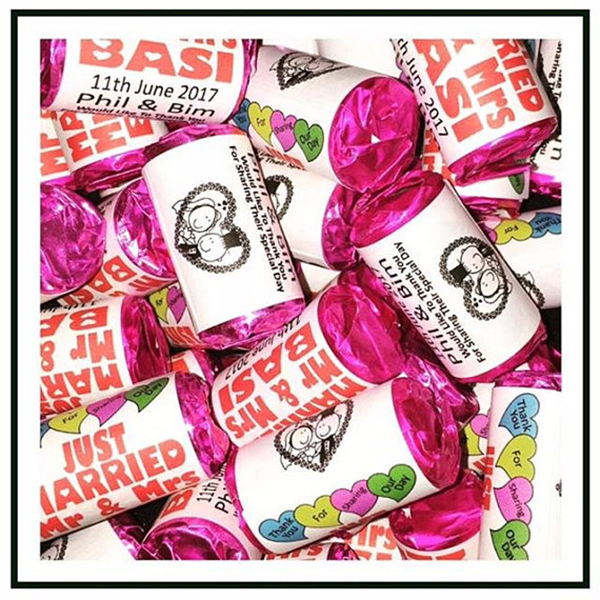 Offer your guests mini love heart packs, which can be personalized with your name and wedding date. Your guests will absolutely love it! 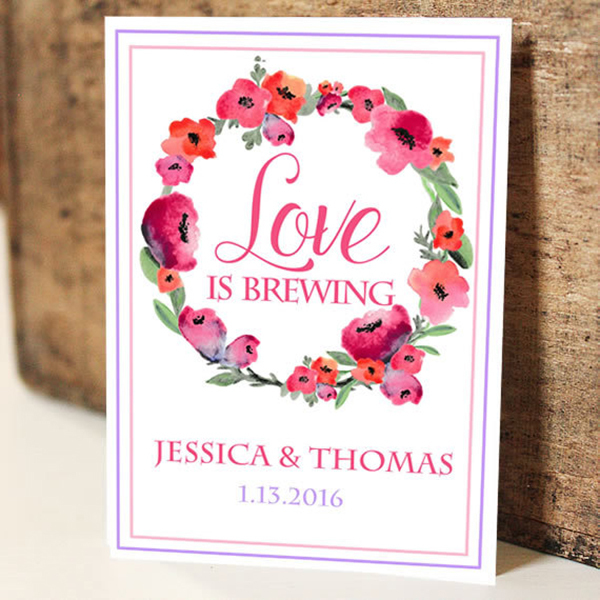 Personalized labels are the perfect finishing touch for your wedding! 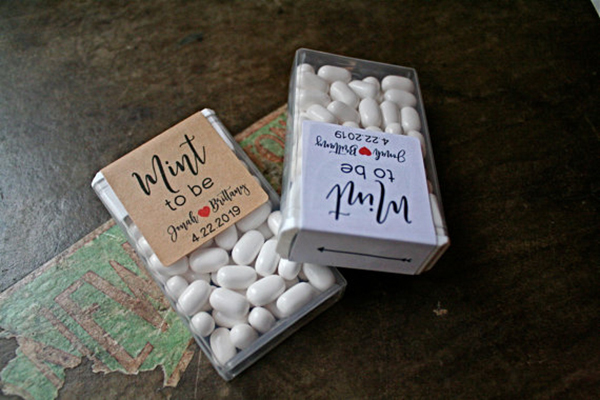 You can use these personalized Tic Tac mint labels and impress your guests. As a wedding favor, you can treat your guests to a cute little jar containing pure honey, decorated with a satin ribbon and a 4 inch honey dipper. You can also add a personalized tag. 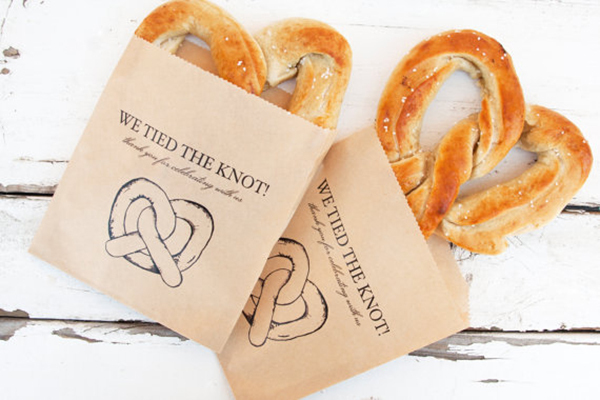 A great idea is to offer your guests pretzels in these cute pretzel bags as a wedding favor! The grease resistant paper will keep the favor looking perfect all night! 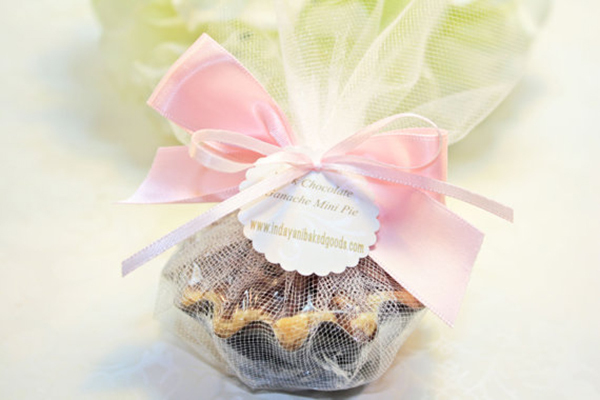 Miniature pies are an excellent way to thank the guests for attending your wedding. You will have a completely customized & fully assembled favor that each of your guests is sure to enjoy! 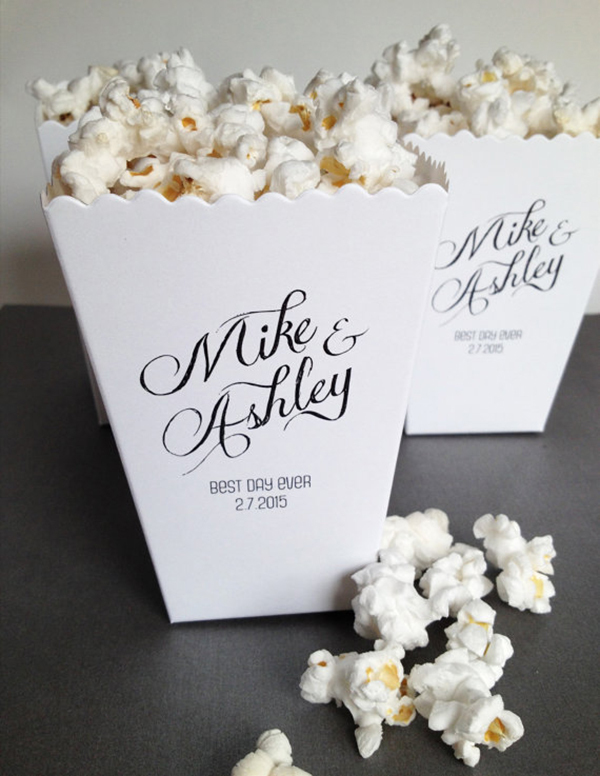 You can personalize these mini popcorn boxes for your wedding and offer your guests a great wedding favor. Have you ever thought that you can offer your guests a wedding favor that they can actually use and wear on your wedding day? From pashminas to flip flops, there are many favors that your guest will wear during your wedding party. Make sure your guests will stay warm with these beautiful pashminas. You can also have a band with a custom message. 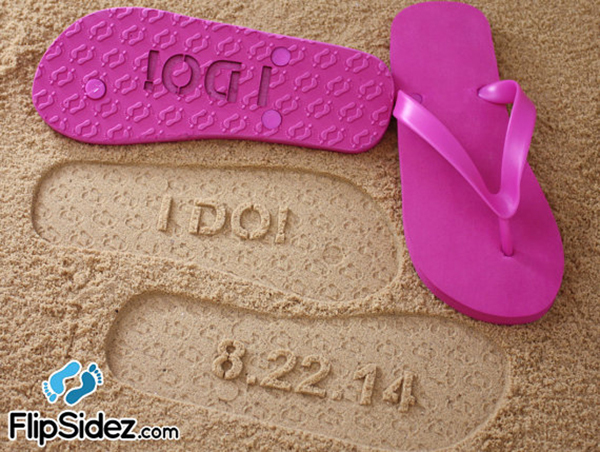 These custom I DO flip flops make a great addition to any beach wedding. Each pair can be personalized with the wedding date or the names of the bride and groom. 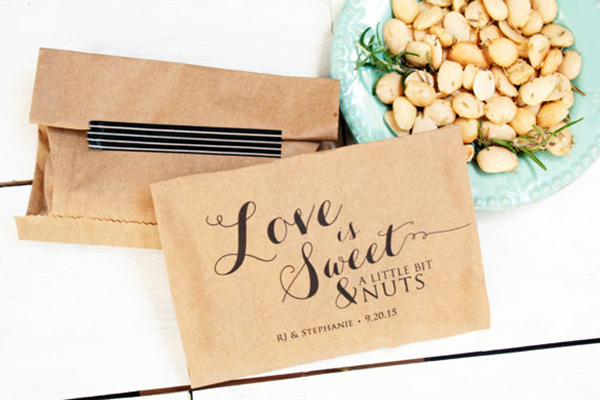 Offer these rollable flats to guests at your wedding as favors. 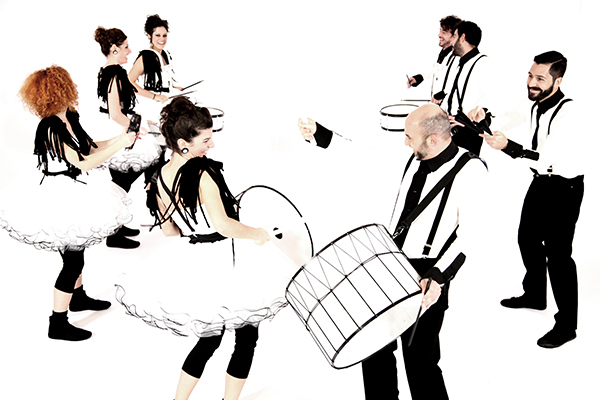 These make the perfect wedding souvenir and favor gift to dance the night away. Most of the time, wedding guests receive beautiful wedding favors, but they cannot really use them. 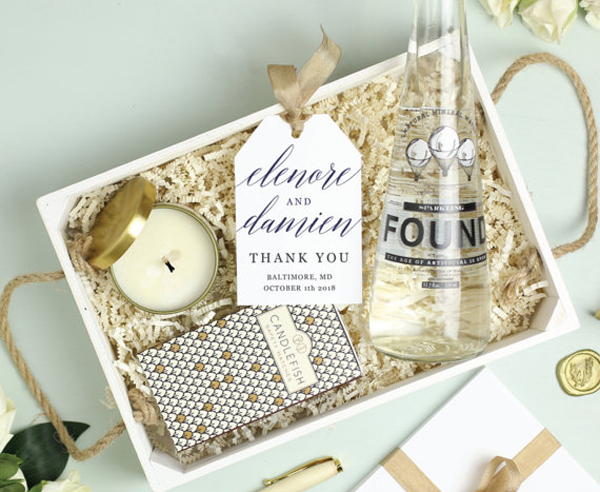 However, the following wedding favors can actually be used and enjoyed by your guests! Having a beach, rustic, country or vintage wedding theme? 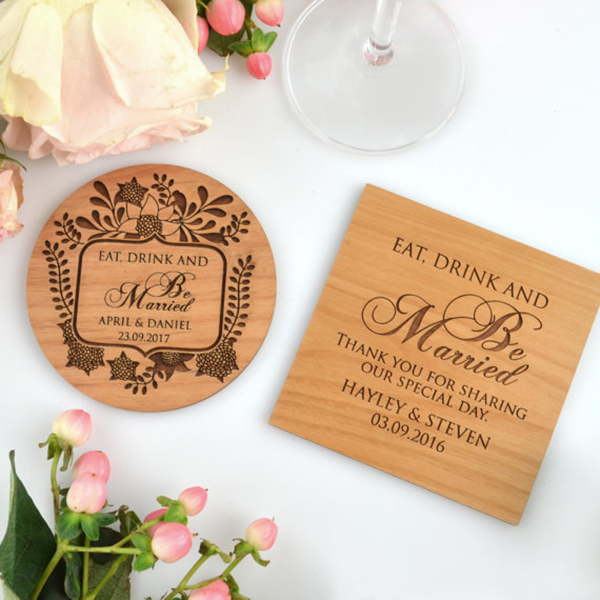 These engraved wooden coasters will make the perfect decoration and keepsake for friends and family on your special day. 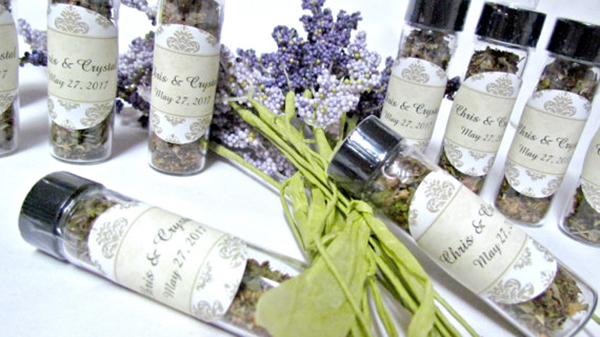 You can offer your guests, as a wedding favor, spices and herbs they can actually use. You can also have a personalized label with your names and wedding date. 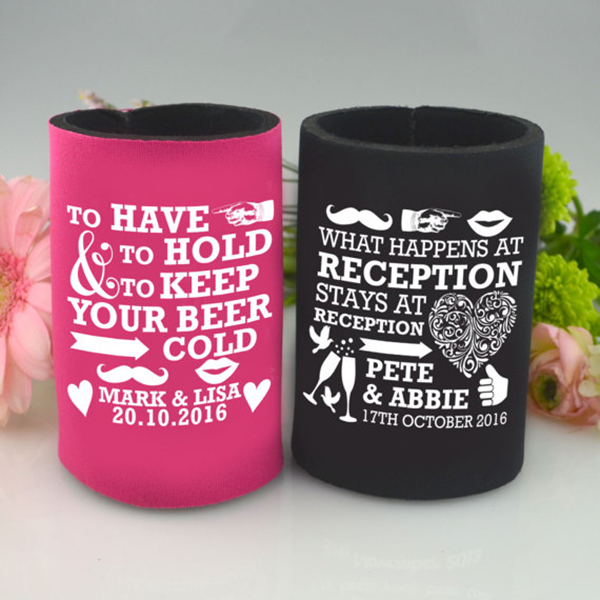 If you are looking for fun wedding favors, you will really appreciate the following list with favors; with fun slogans and designs they will excite your wedding guests. 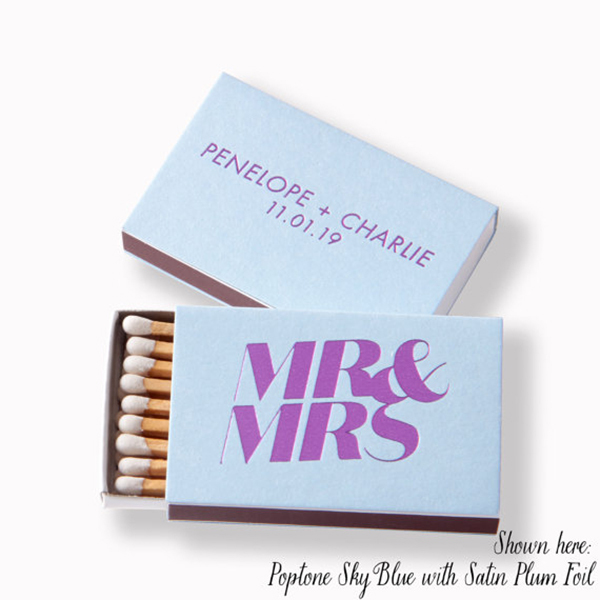 If you are looking for small and fun gifts for your guests, these Mr & Mrs matchboxes are perfect! 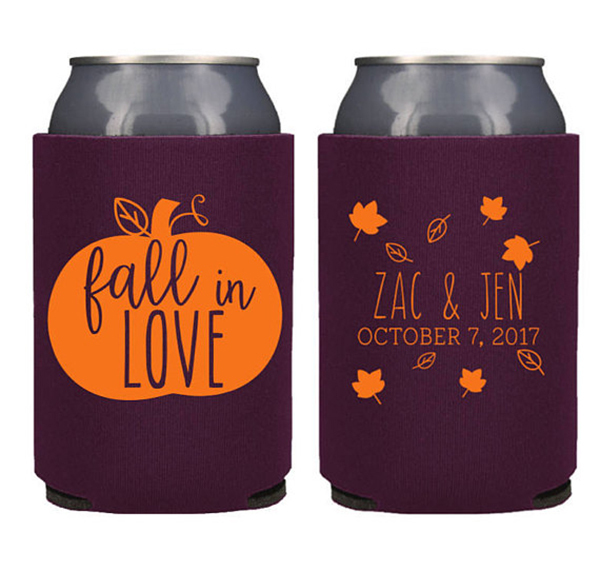 These wedding stubby holders are a fun and cute wedding gift for your guests to keep their drinks cold. These grease resistant bag is a perfect favor bag for nuts; just add your own hazelnuts, peanuts, candied nuts. 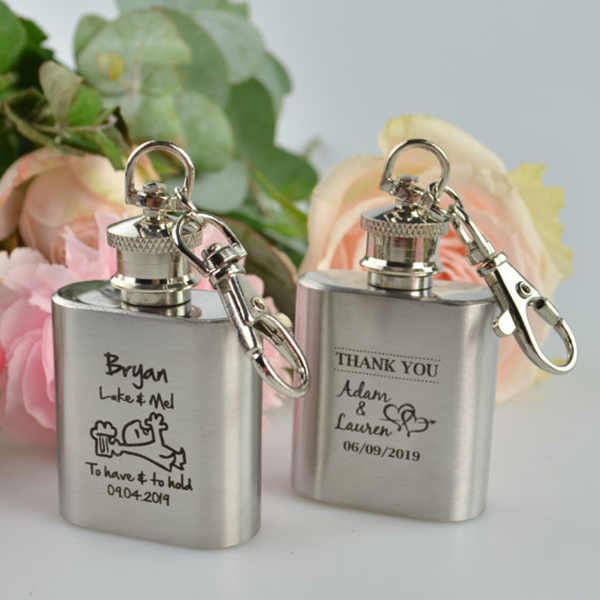 Give a fun and unique wedding gift to family and friends with this gorgeous engraved mini hip flask keyring. 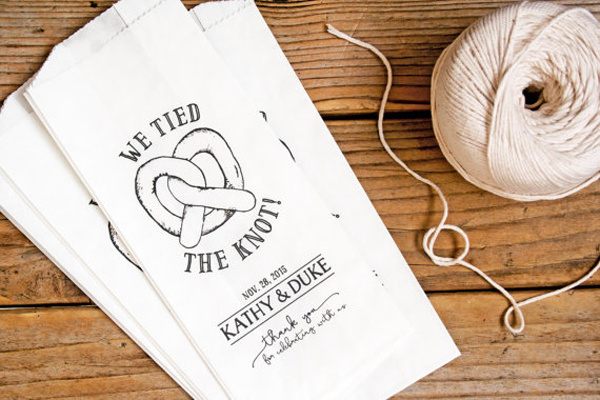 Your guests will love this fun yet practical wedding favor. Your little guests will be really excited if they receive their own custome favor for kids. From children's boxes filled with books and stickers to personalized kids cups, there are many options to make your little guests happy. 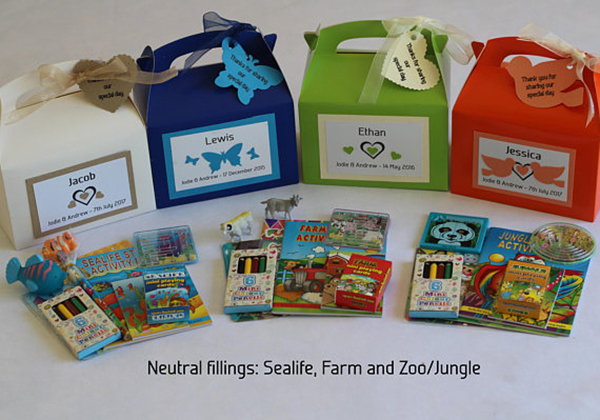 These lovely personalised children's boxes will make great wedding gifts for your child guests as well as keeping them entertained throughout the day. 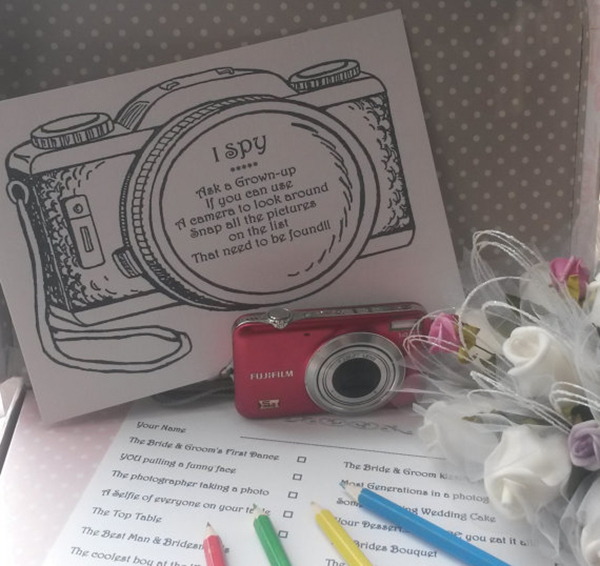 Entertain your little people at your wedding with these I Spy cards. They are designed specifically for your little guests and keep them entertained during all the "boring" bits. 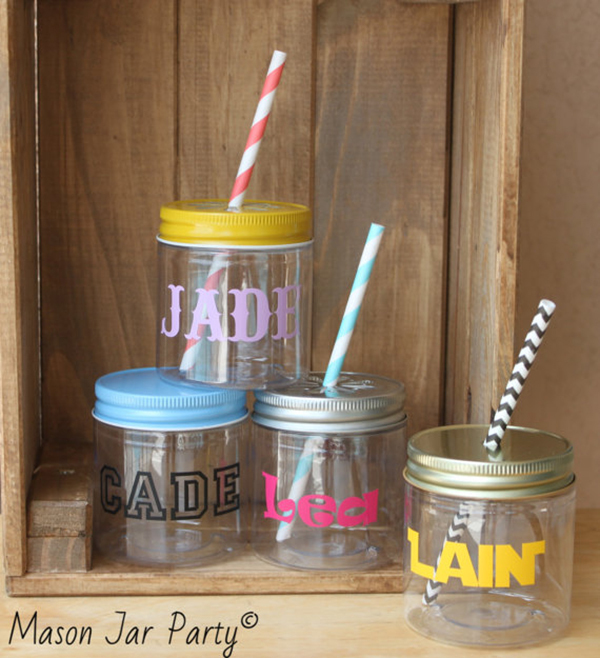 These plastic mason jars are the perfect gift for the kids on your wedding. You can personalize them with the kids' names and choose different lits. 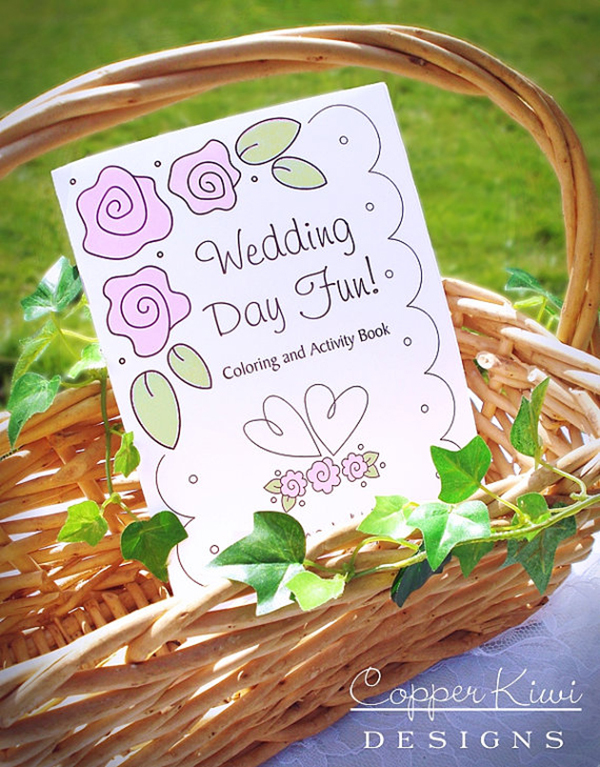 This wedding coloring book makes a really fun wedding favor for kids of all ages, even adults! It's a great way to keep kids occupied so they don't get bored! 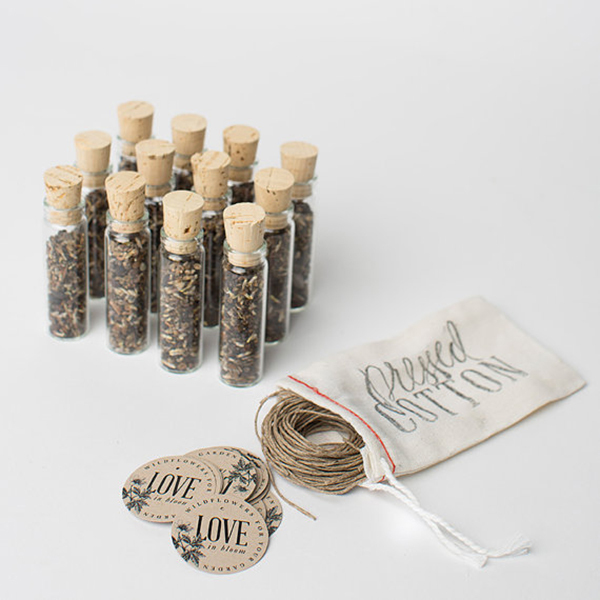 A special and unique wedding favor option is test tube favors; filled with honey, bath salts or loose leaf tea, will amaze your guests. 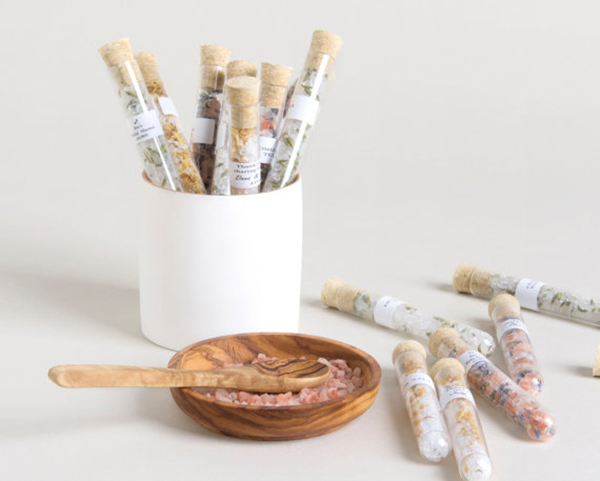 A great idea is to offer your guests natural and botanically fragrant bath salts in these elegant glass test tubes closed with a cork! 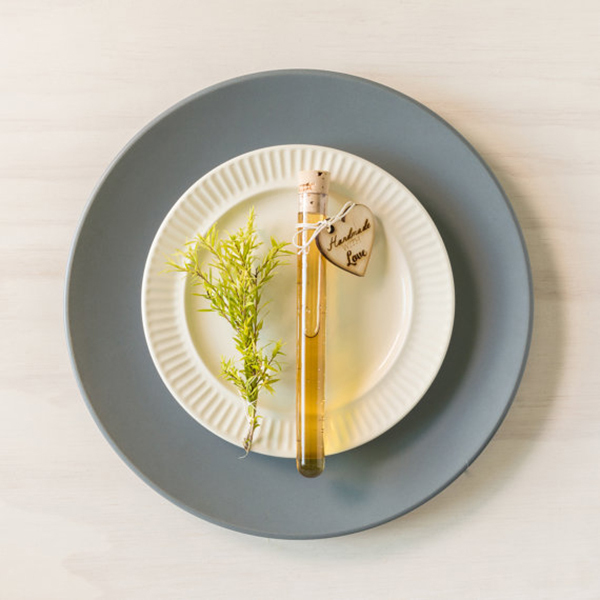 A unique idea is to offer test tubes with honey as a wedding favor; you can also add a custom tag. 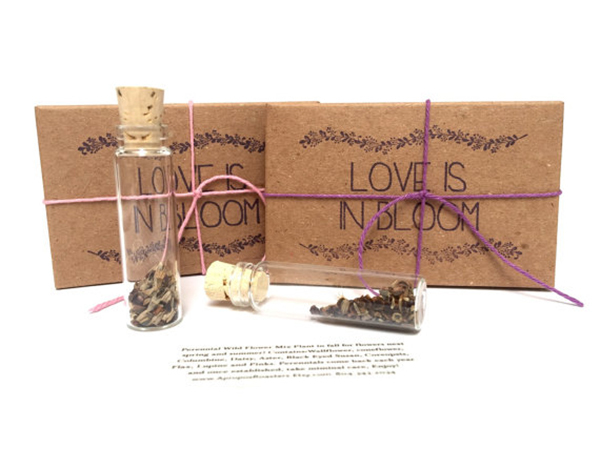 Offer your guests a unique wedding favor; a test tube filled with loose leaf tea that your guests can enjoy. 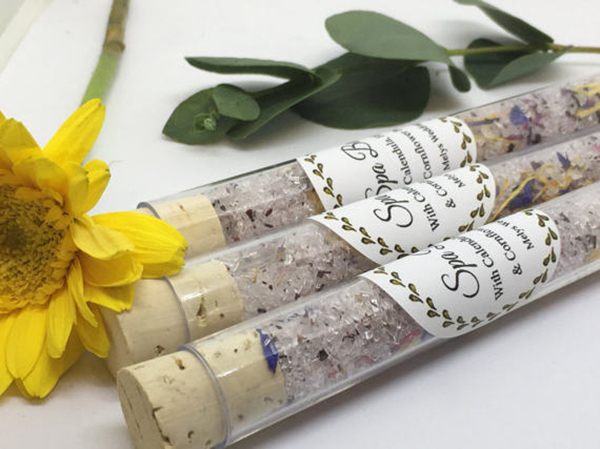 If you are looking for favors that your guests will enjoy to use, these luxurious botanical blends of salts, floral and essential oils are perfect. 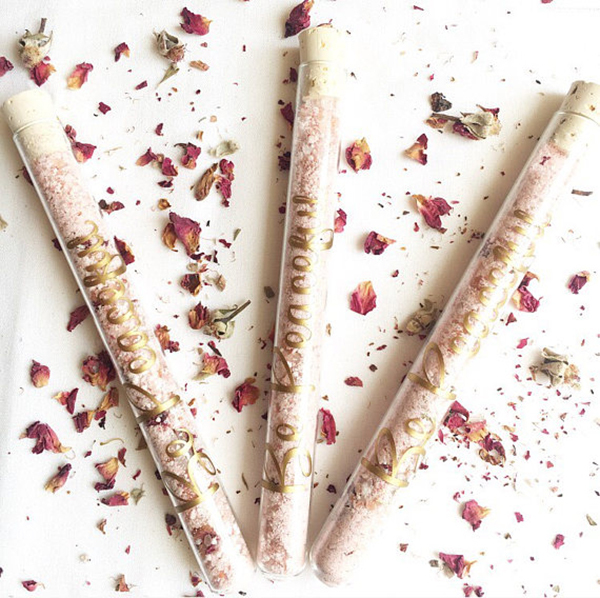 These test tubes filled with Epsom salts, Dead Sea salts and flower petals make lovely gifts for your wedding guests. Another unique idea for wedding favors are succulent wedding favors. Succulent design will be perfect on favor bags or matchboxes. 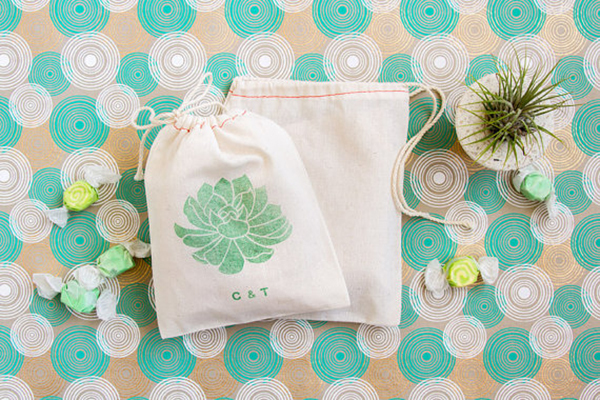 Your wedding guests will love these favor bags handstamped with a green succulent and your initials. 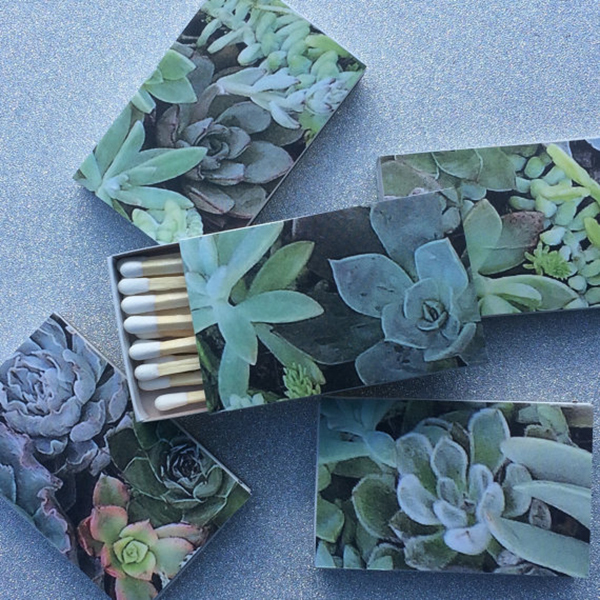 This succulents matchbox is a unique and lovely gift to give to your wedding guests. If you wish, you can add your names and wedding date. 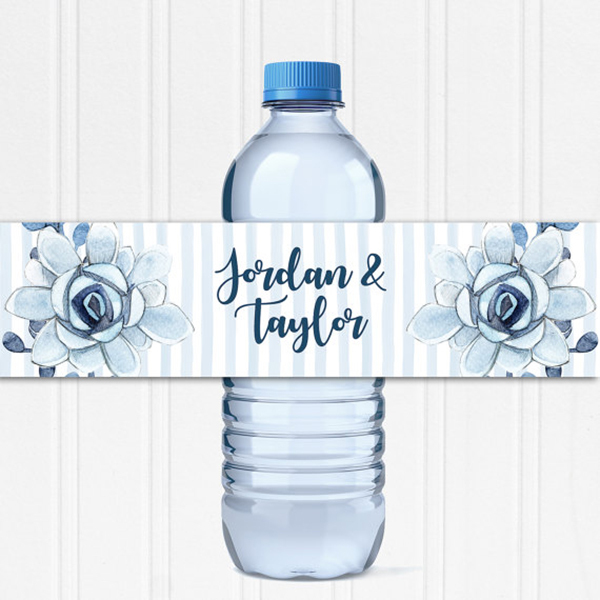 These watercolor wedding water bottle labels are a cute detail to have on your wedding. If you are loving lavender, why not offering your guests wedding favors with lavender? 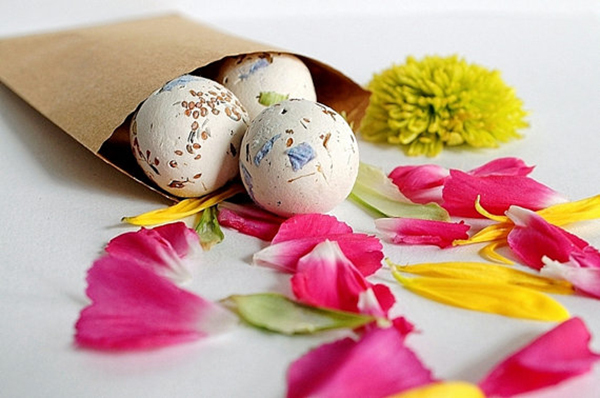 There are lavender bath bombs, lip palms and lavender sachets which you can give to your guests as a wedding favor. Lavender sachets that can be refilled when needed are a perfect gift for your guests. 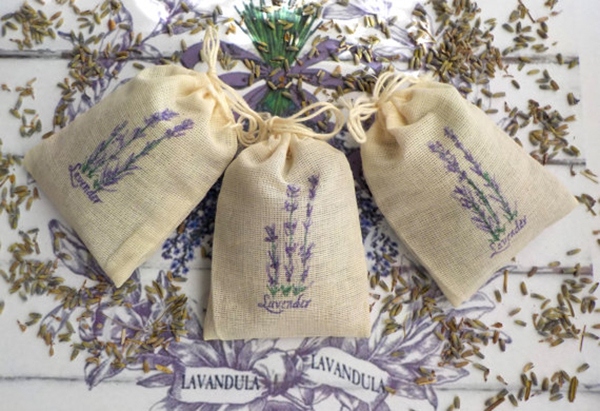 The wonderful & soothing scent of Lavender in a cotton sachet drawstring bag will amaze your guests. 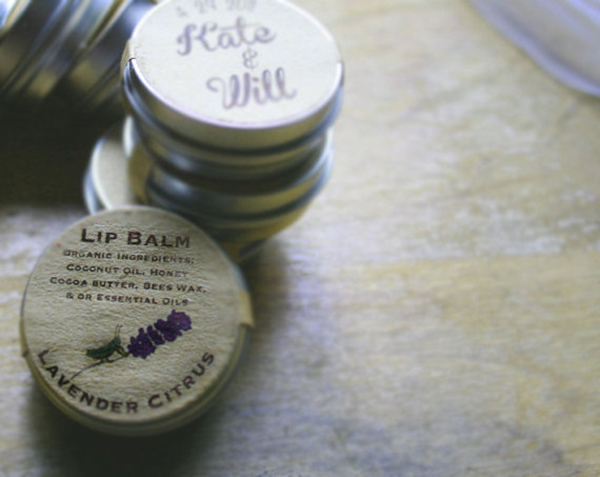 This organic lip balm scented with lavender is a perfect wedding gift. The blend is not glossy, but coats softly and smells sweet and delicious! 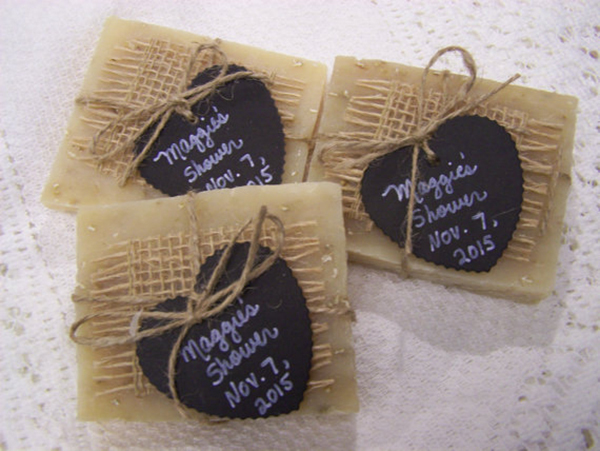 A useful and sweet wedding favor you can offer to your guests is soap. There are plenty of colors and flavors to fit your and your guests taste. These sweet little mini soaps can be a lovely wedding gift for your guests! 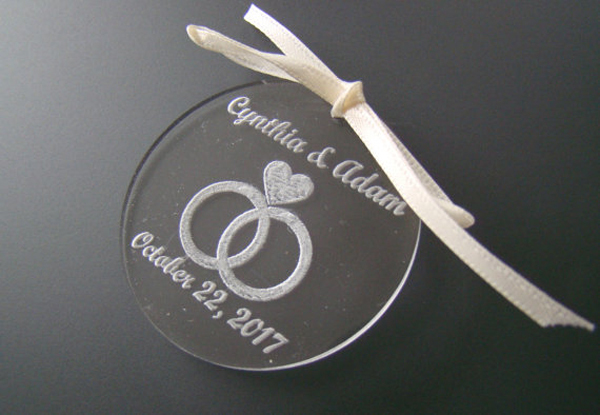 They can be personalized or customized to your wedding. 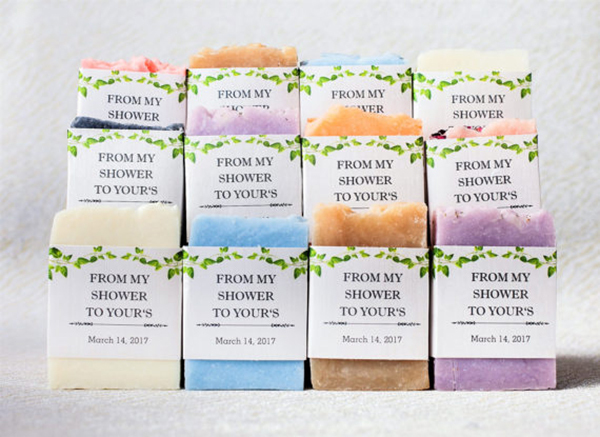 These fragrant handmade soaps are a nice wedding gift; you can choose different colors and flavors that your guests will love. 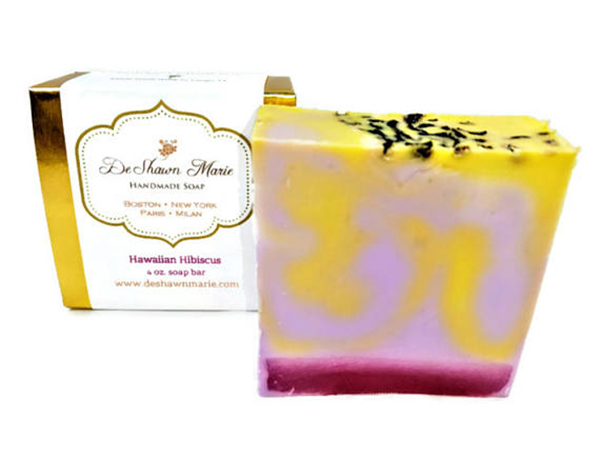 This beautiful, floral and tropical Hawaiian Hibiscus soap will add a little bit of Hawaii to your guests' bathrooms. If you are having a beach wedding, there is nothing better than beach inspired wedding favors to offer to your guests. 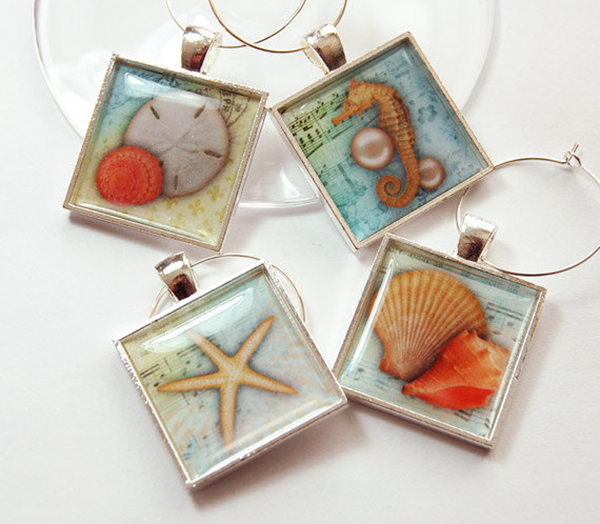 From sea shell wine charms to starfish chocolate favors, the options are unlimited. These wine charms are the perfect wedding favor for a beach wedding. 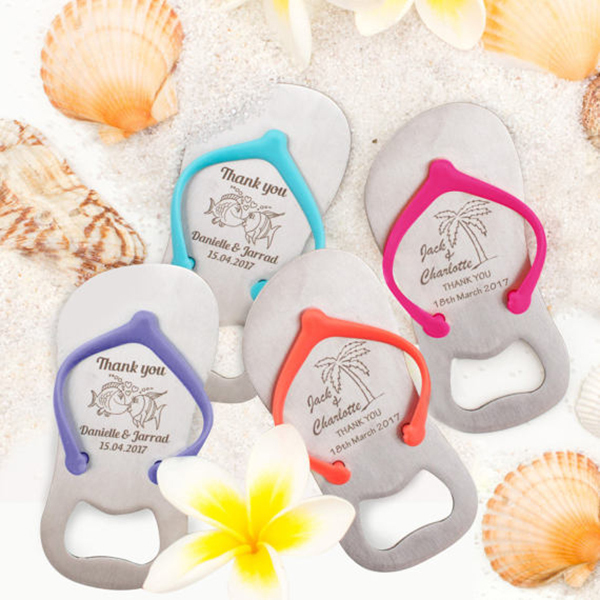 These mini flip flop bottle openers are a very unique and creative remembrance gift to mark your wedding celebration. 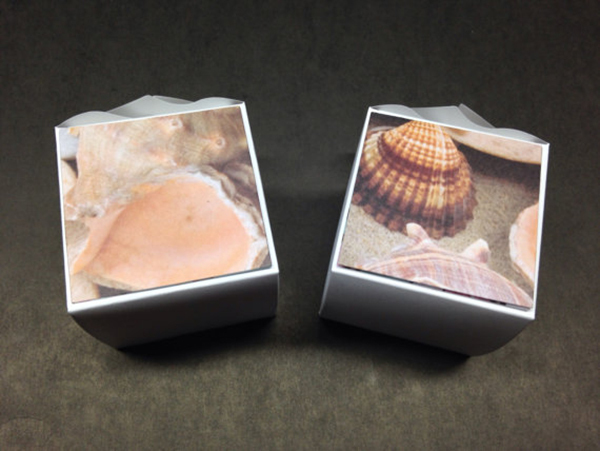 This beach themed favor boxes are perfect for a beach or beach themed wedding! 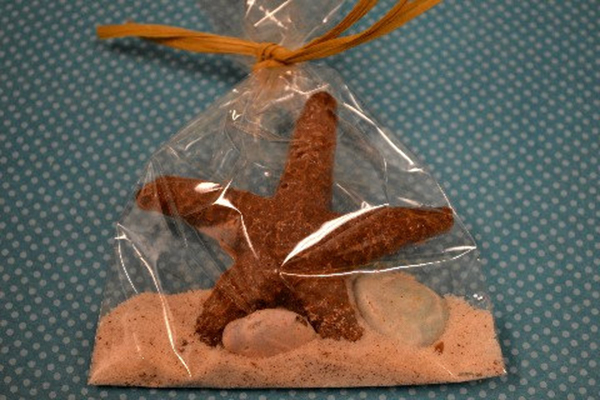 These chocolate starfish favor bags are a delicious addition to any beach wedding. Each cellophane bag comes with a milk chocolate starfish and 2 hard candy chocolate shells. One of the most simple and chic wedding favor option is wedding favors with tulle. Offer your guests koufeta or any other gift in tulle bags and your guests will certainly love it. Offer your guests Jordan almonds/koufeta in a gold sparkle tulle with white tulle and white ribbon. You can offer your guests beautiful flower bulb favors. Your guests can plant the flower bulb somewhere special and remember your special event year after year! 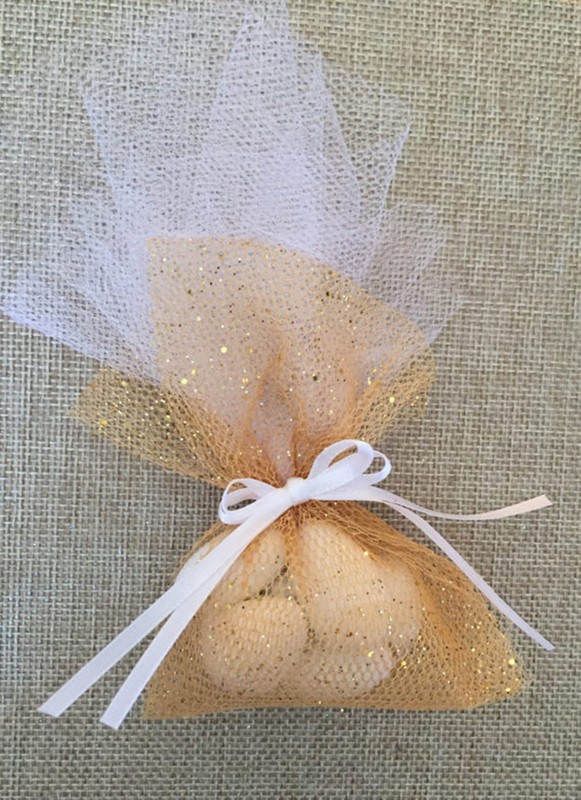 These ivory net lace favor bags are just the right size for three or five Jordan almonds. We truly hope you enjoyed this incredibly detailed list of wedding favors and found it helpful. If you would like any type of wedding favor we have missed, please do so in the comments below! 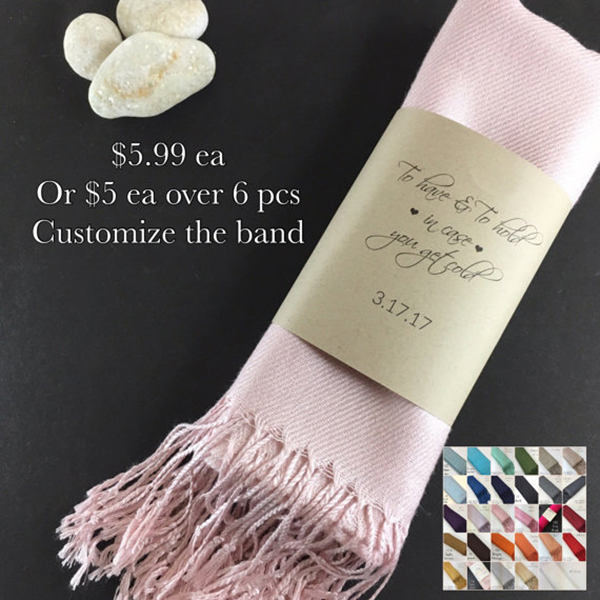 Love the pashmina with the customized label for my fall wedding!